2018 has been a year of upheaval. After four-and-a half-years living in The Hague we relocated 700km east to start a new chapter of life in Berlin. Truth be told, we didn’t want to leave our Dutch lives behind, but circumstances don’t always give you the choice. So, with heavy hearts, we loaded up our belongings for the third time in seven years and headed towards a new beginning. Six months in Berlin has been enough to underscore the cultural chasm between the two countries – plus it’s over 250km to the beach from here. 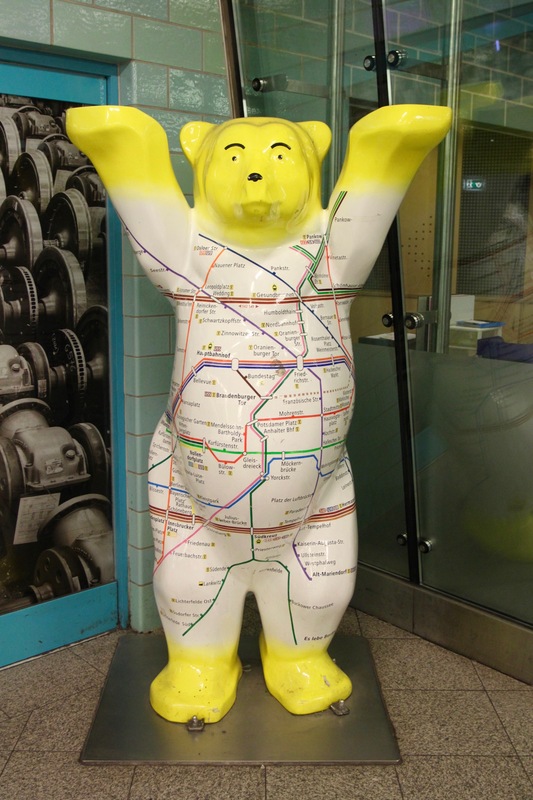 As we adjust to our new world there will be opportunities to explore Germany’s fascinating regions, and to look further east (Poland is a 100km away) and after sampling Berlin’s winter, I’m already looking forward to the Berlin spring. These are my 2018 highlights (France features ‘biggly’, to quote the US President) … and here’s to 2019, the Year of the Bear. If there’s one thing to be said for leaving a country, it’s that it gives you pause to recall all the wonderful places you’ve visited. For me, it also meant a few days photographing and writing about the city we called home, The Hague. We hadn’t planned to move to the Netherlands, but it is a country that has seared its way into our affections in a big way. Each photo is a place I’d like to return to, at least once I’ve visited the places we missed the first time around. Contemporary Berlin comes with huge expectations: history and culture merge with a reputation as one of the coolest cities on the planet. Yet our early impressions were of dealing with bureaucracy and trying to find an apartment in a hostile housing market. This took place in a heatwave, temperatures hovering around 35ºC. Uncomfortable in our new home in more ways than one, we’re slowly adapting to Berlin life and trying to learn basic German. An early summer road trip introduced us to two of Germany’s great North Sea port cities, Bremen and Hamburg. I’d never been to either and both left a lasting impression. They suffered massive damage in the war but both have reinvented themselves for the modern era. Bremen mixes Hanseatic history with cultural riches and good food; while Hamburg became my favourite city of 2018, effortlessly cool, relaxed, friendly and full of culture. 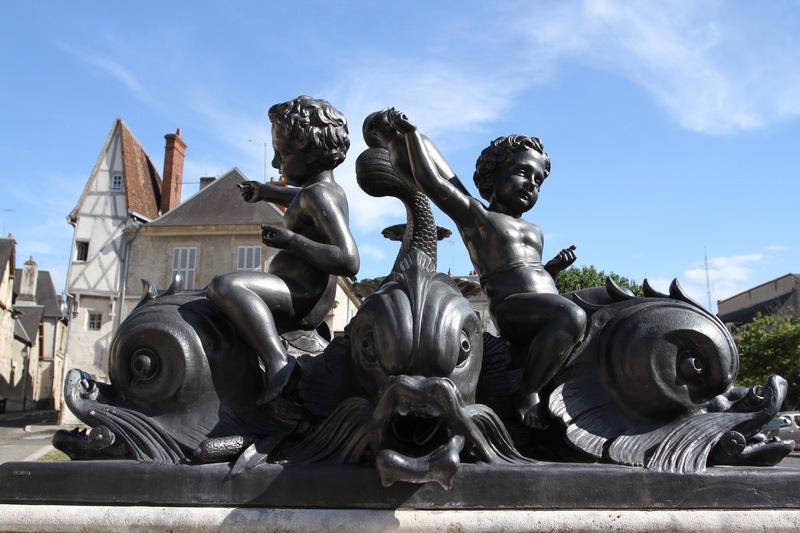 The Loire Valley is a place filled with glories. 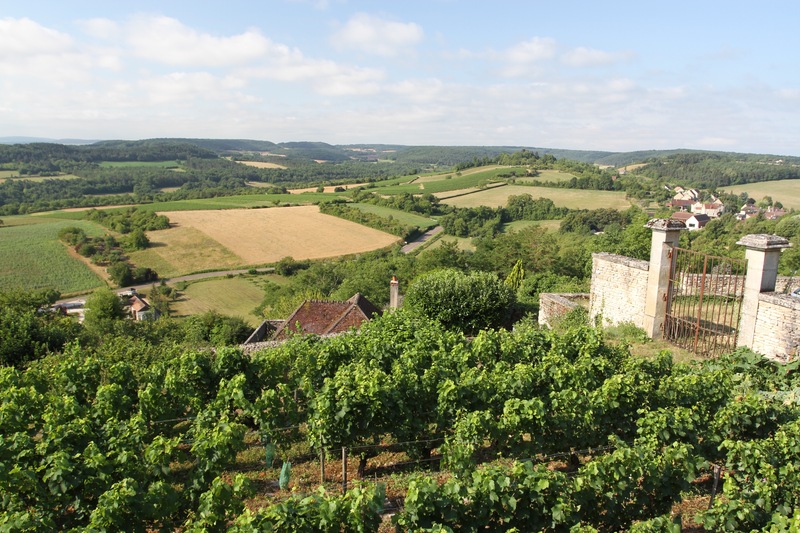 Beautiful landscapes hide magnificent château, ancient towns and world class vineyards. 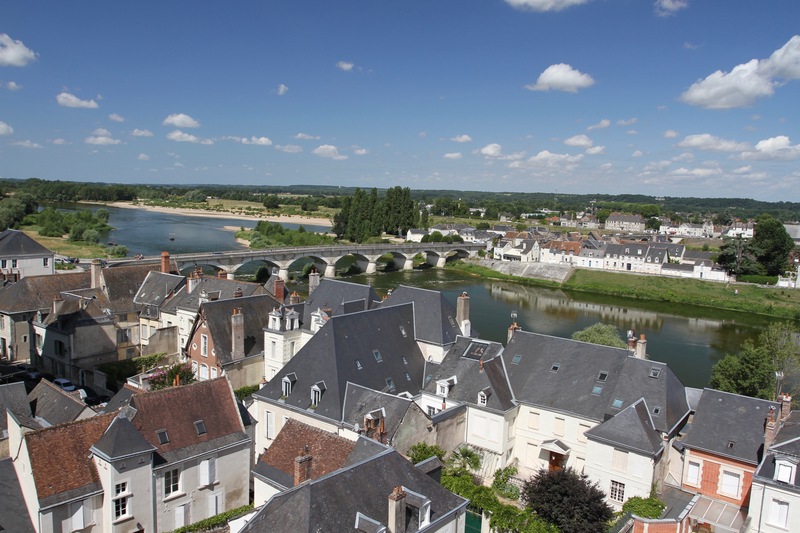 I’d been bouncing around the French countryside and stopped in the utterly beguiling town of Amboise. Dominated by the Château d’Amboise, this is where Leonardo da Vinci spent his final years, dying in the town and buried in the Royal château. My final day was spent at the extraordinary Château de Villandry. Just before we left the Netherlands, there was one final road trip to France – it won’t be so easy to hop in the car and head to Champagne, Burgundy or the Loire from Berlin. 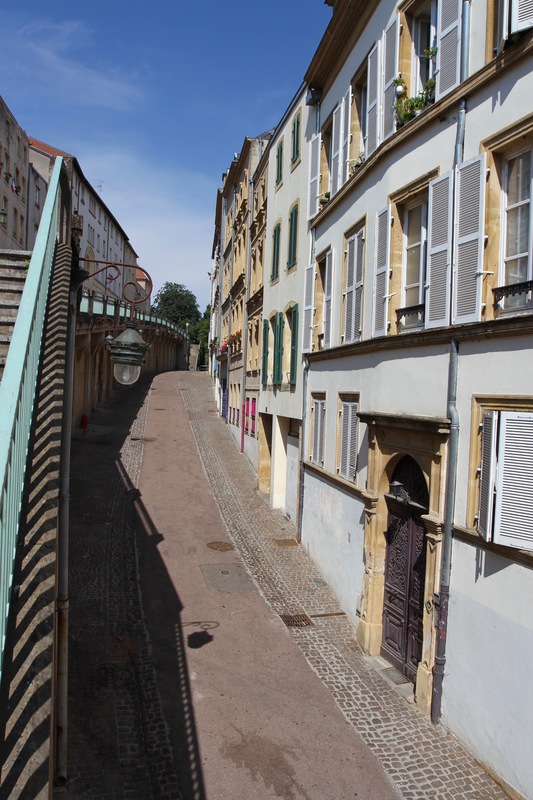 It was a trip of firsts that included the city of Metz, home to the Pompidou Centre and where I got to experience the massive street party that was France winning the World Cup. It was a crazy few days of culture, good food and partying. We stopped in the distinctly French town of Nancy en route to Alsace. The difference between it and the decidedly Germanic Alsace region came as a bit of a surprise. That didn’t take away from the rolling landscapes and the even more extraordinary historic villages of timber-framed buildings that we encountered. 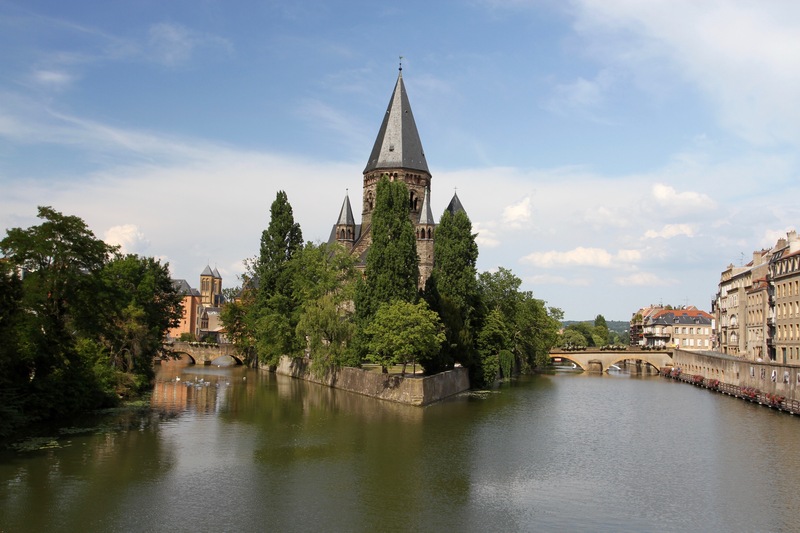 Our journey through Alsace’s vineyards was fantastic and introduced us to German wine varieties – which, ironically, has subsequently come in handy. Rarely a year goes past without a visit to Spain. 2018 was no different, with a few days in Madrid followed by a trip to nearby Segovia. I’d heard of this historic town but was unprepared for just how beautiful it was, especially coming with a backdrop of snow covered mountains. There is so much to admire in the town, from the 12th century Alcázar to the lamb and suckling pig specialities, but it is the Roman aqueduct that takes centre stage. It’s been nearly 30 years since I last visited Copenhagen, a few hours of wandering its historic centre had me wondering why it had taken so long to return. It was a shame that, after spending a week in various meetings and at a conference, I only had a day to reacquaint myself with the city. It was enough to make sure we’ll be returning when the weather improves in the spring. Italy remains an under-explored country for me. This trip to Sicily was a first visit to the country’s most southerly region. We immersed ourselves in millennia of history while enjoying excellent seafood and local wines; took in ancient hilltop villages that are a byword for baroque architecture; ate fresh fish on the Mediterranean in a former tuna fishing village; and visited the Ancient Greek and Roman ruins of Morgantina and Villa Romana del Casale. The highlight though, was the near-mythical city of Syracuse. 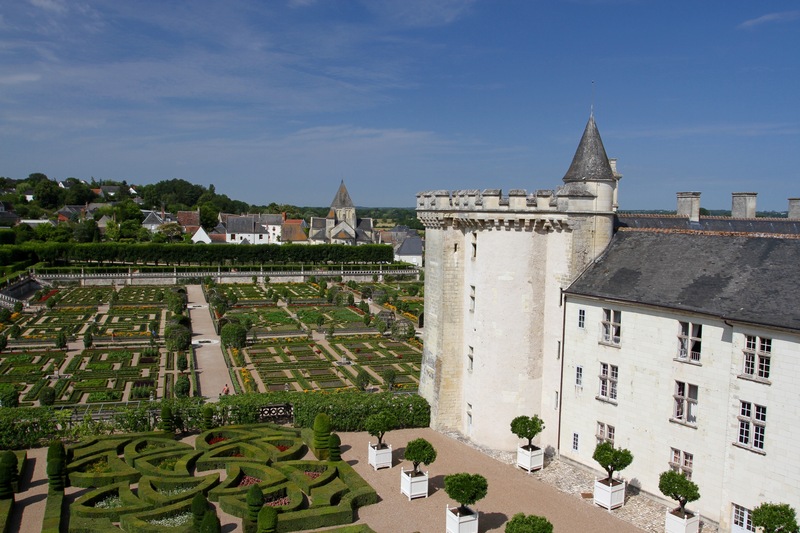 No trip to the Loire Valley would be complete without visiting at least one spellbinding château. 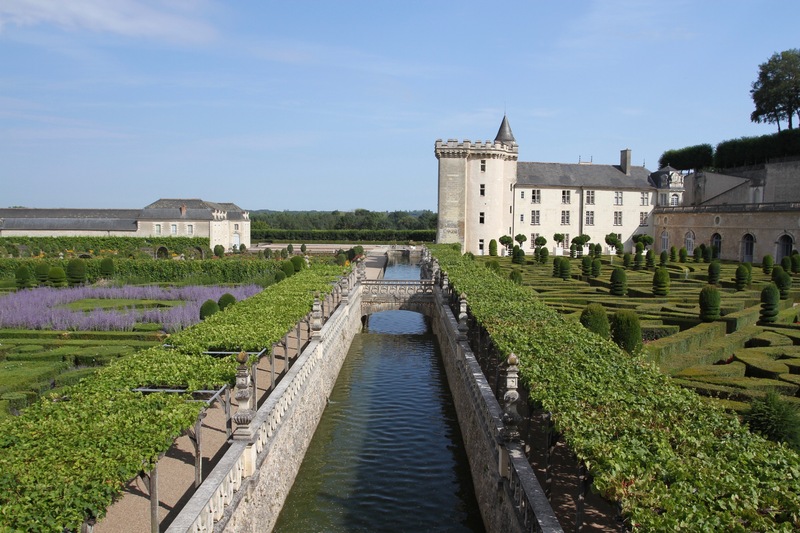 That though creates its own dilemma: with so many extraordinary château to visit, which one is the one? 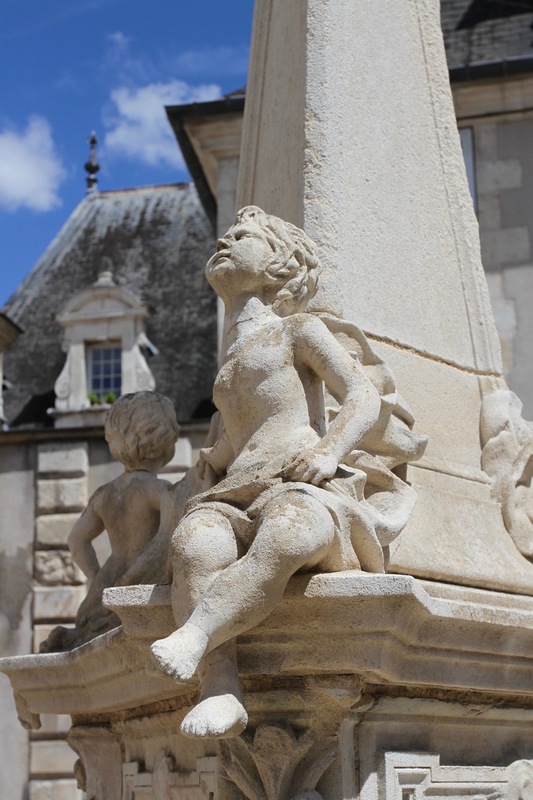 We went to the magnificent Château de Chenonceau two year’s ago, which was swamped with tour groups by mid-morning but is still an amazing place to visit. I did some research over dinner and decided the Renaissance glories of the Château de Villandry would be an appropriate Loire finale before driving back to the Netherlands. 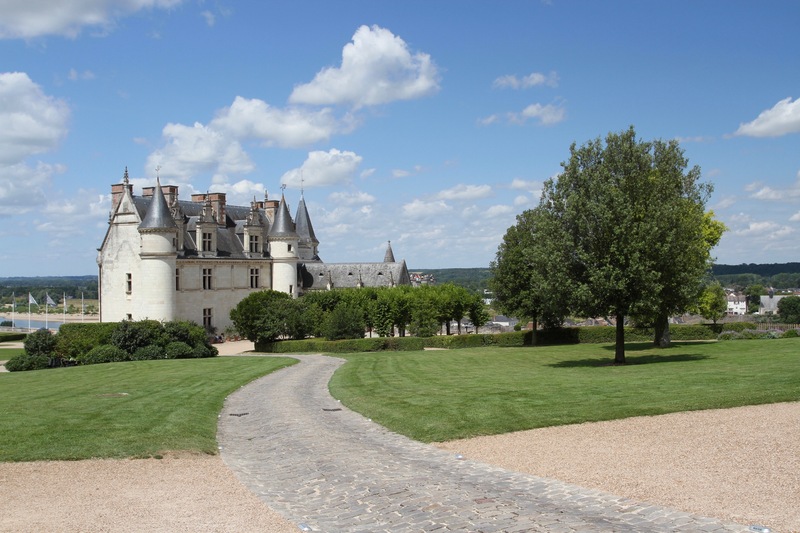 While this is one of the most beautiful, and certainly one of the most visited, of all the Loire’s château, people don’t really come for the building. 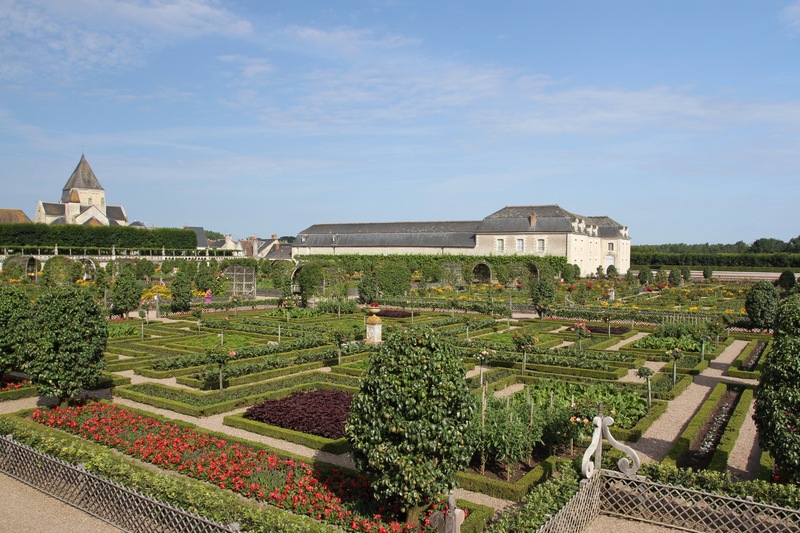 At Villandry, people visit for the spectacular gardens. 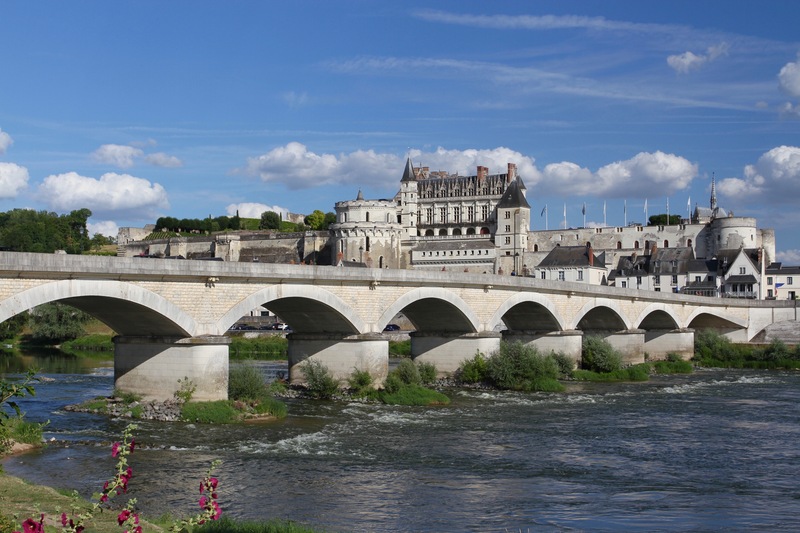 The château sits close to the Cher river, about 40km away from my base in Amboise and, despite arriving just after it had opened, the car park was already pretty busy. I made my way in, just sneaking ahead of a large school party, and soon found myself clambering to a terrace with exquisite views across the gardens. The elevated view provided sweeping vistas over the 9 hectares of manicured grounds that are divided into six distinct gardens. 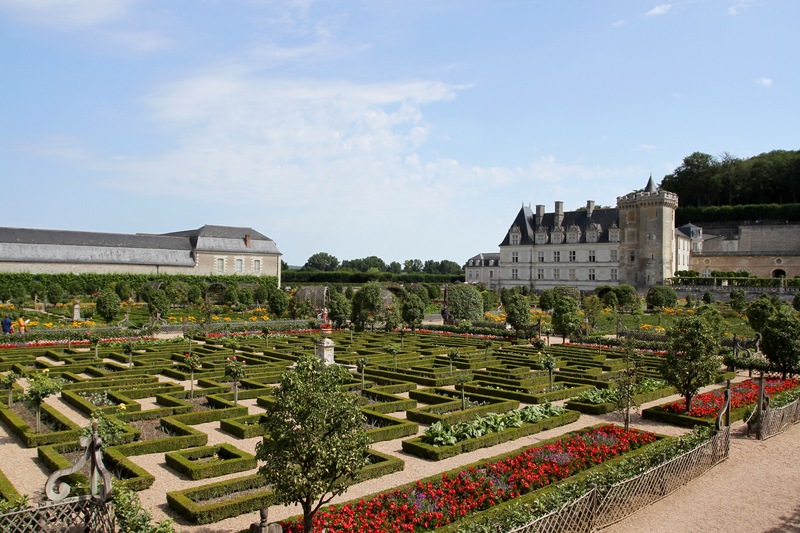 They are mostly formal gardens, but there is also a kitchen garden of herbs and vegetables, and an area furthest from the château that is more like a wild garden. On the terrace you can see the symbolism of the garden designs. 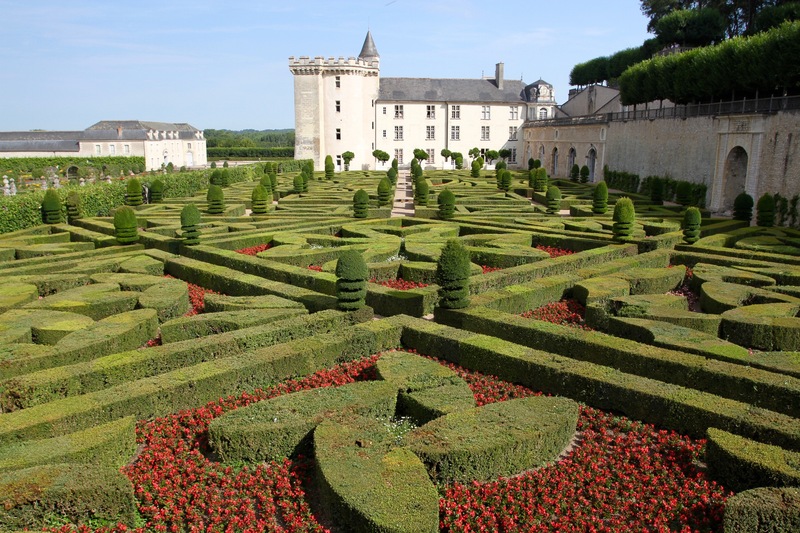 The jardin de l’amour is a patchwork of boxed hedges filled with flowers that are symbols for Tender Love, Fickle Love, Tragic Love and, of course, Passionate Love. Not for nothing is the Château de Villandry known as one of the most romantic of all France’s châteaux. The flower colours match the type of love: yellow for betrayed love, red for love rivalries that ended in bloodshed. It’s ridiculously picturesque, but also has a love story and great romance to go wth it. Joachim Carvallo, a Spanish doctor, and Ann Coleman, met and fell in love while they were living in Paris, where she worked in his medical research team. She also happened to be heiress to a US steel empire, which was convenient when they fell in love with the dilapidated château in the early 1900s. 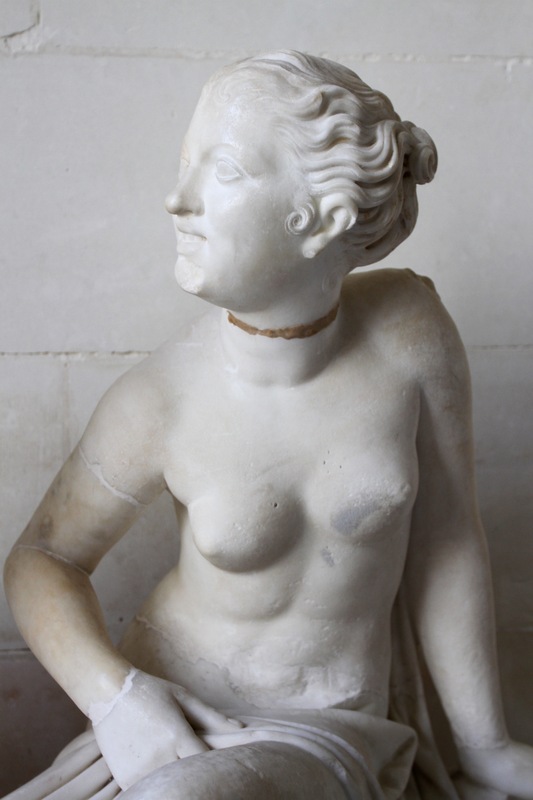 They ploughed both their money and passion into returning Villandry to its past glories. 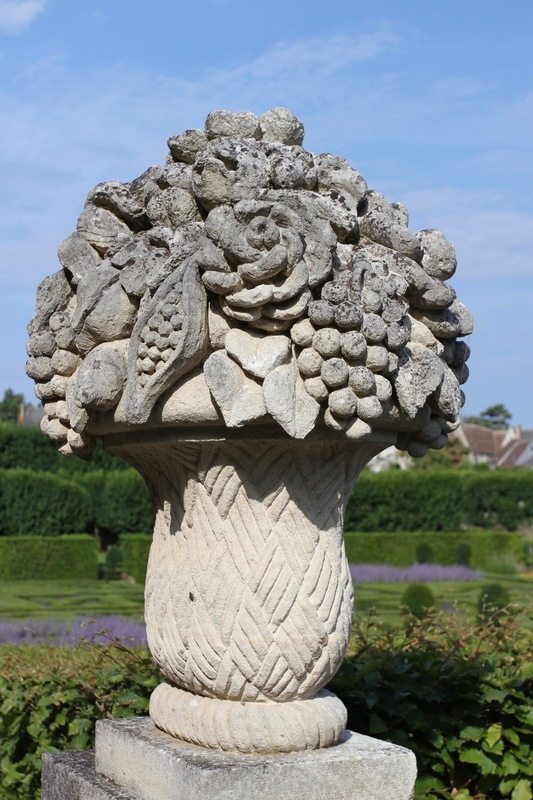 The love garden reflects their passion for each other and the château itself. I’d timed my visit well, the gardens were in full bloom. I left the terrace and spent a couple of hours meandering around the grounds. It was very peaceful. The château was built in the 1540s on the site of a much older castle, which in 1189 was the site of one of the great moments in Anglo-French history. 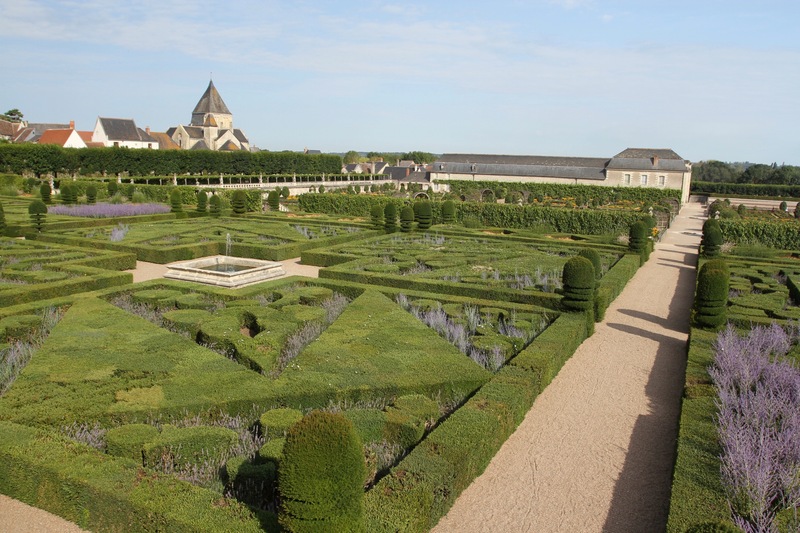 At Villandry, Henry II of England – the king who had Thomas Beckett murdered – surrendered to Philip II of France. Henry’s son and future King of England, Richard the Lionheart, had defied his father to support Philip II, whose daughter, Alice, Richard was supposed to marry. He, of course, left for the crusades and never married Alice. Complex things, royal families. 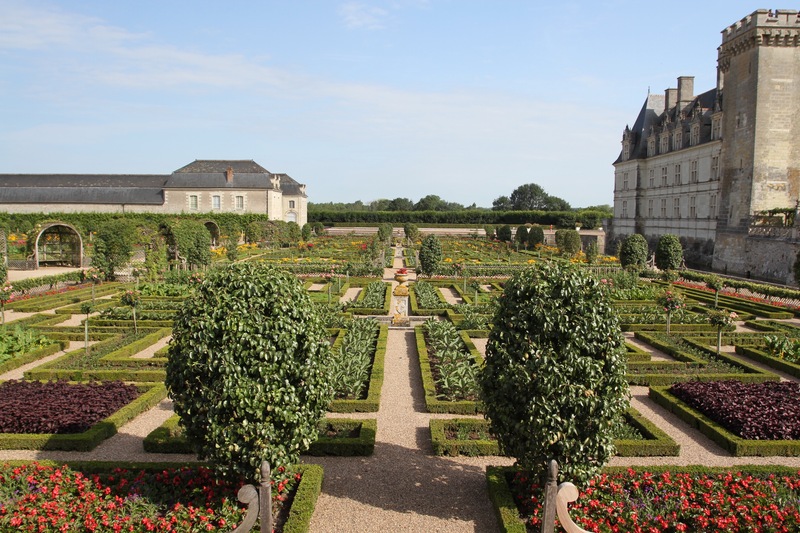 The new château and gardens were built by Jean Le Breton, who served François I of France as finance minister, and was the first of many illustrious owners. 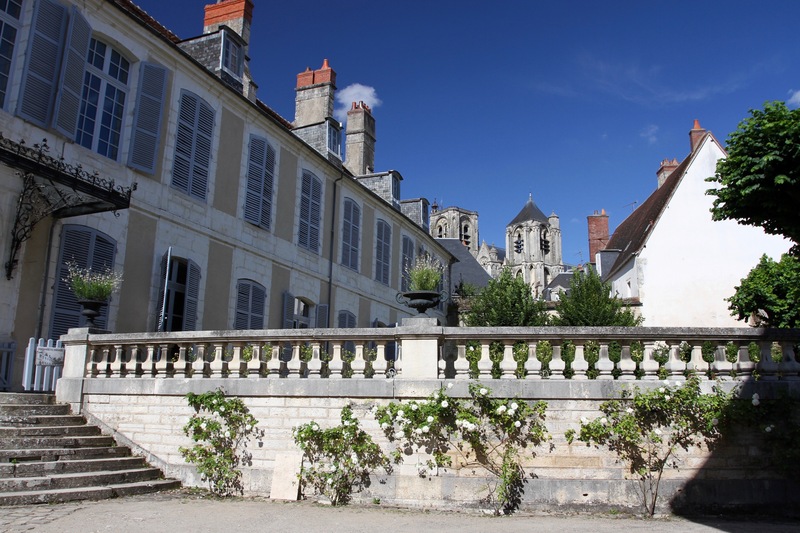 Villandry was also home to the Marquis de Castellane, who served as ambassador to Louis XV. Later, Jerome Bonaparte, brother of Napoleon, would take up residence here. 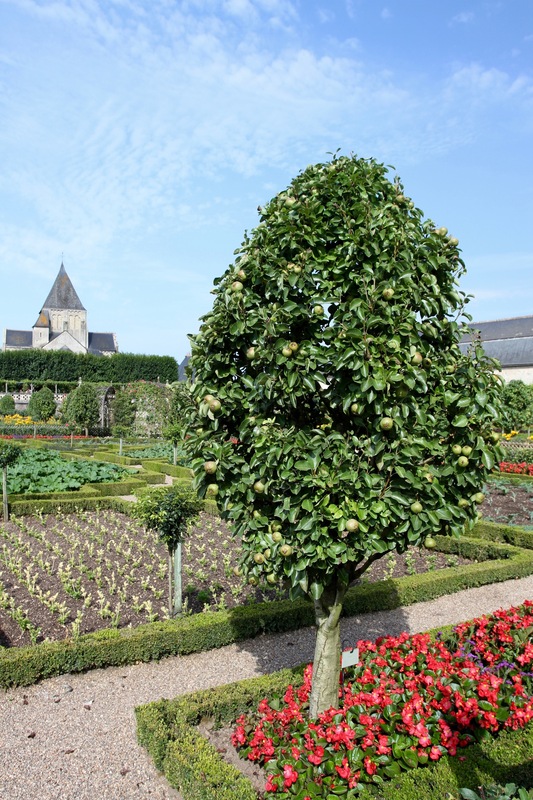 The buildings and gardens are today an UNESCO World Heritage Site, an honour that, despite all of Villandry’s famed owners and history, properly belongs to Joachim Carvallo and Ann Coleman. 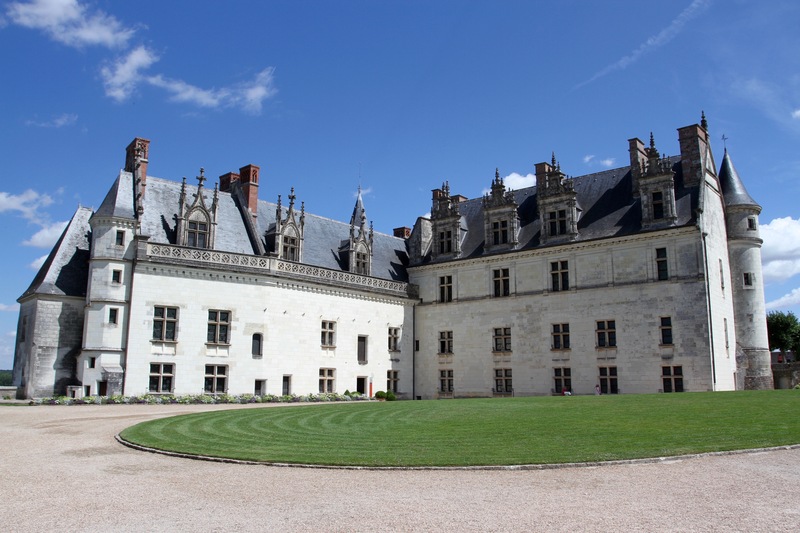 Amboise has two world-class attractions, the Château Royal d’Amboise and the equally extraordinary Château du Clos Lucé, or Clos Lucé as it is almost universally known. It was to here that I headed after a morning exploring the history of Château d’Amboise, but first it was time for lunch. 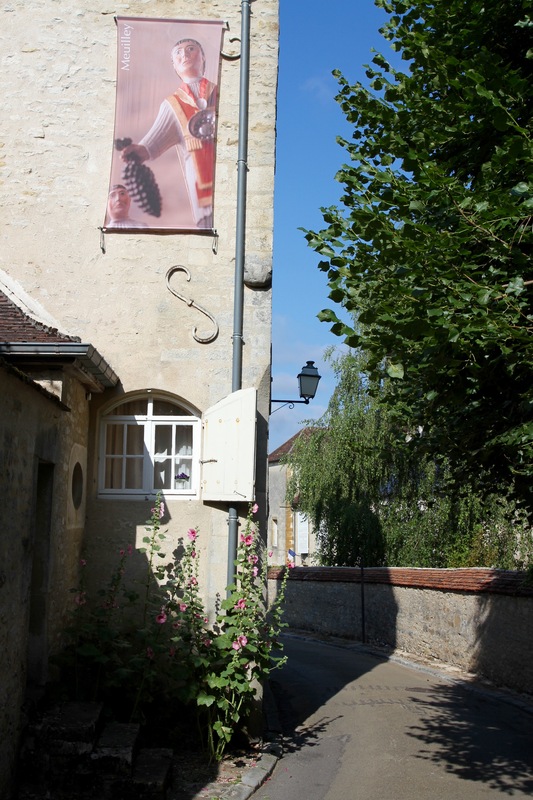 The exit from the château disgorges you onto a street directly opposite La Cave, a wine shop that offers charcuterie and tastings. I took this as a sign of divine providence, sat in the shade and ordered a glass of the owner’s own Vouvray wine. The heat was now ferocious, the mercury rising to a terrible 38°C. It took an immense amount of determination not to head to the air conditioning of my hotel room. 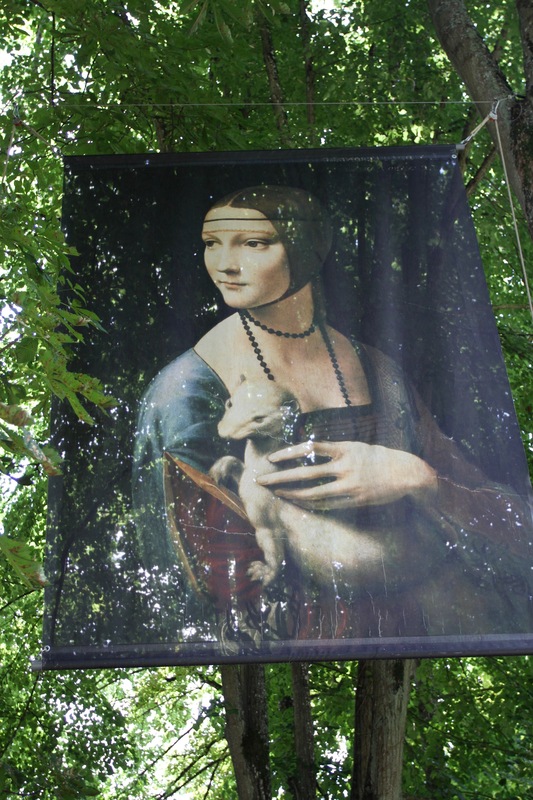 Instead, I plodded uphill towards the estate where Leonardo da Vinci spent the last three years of his life as a guest of the French King, Francis I. Amidst wonderful gardens, the Italian genius of the Renaissance spent his time inventing and painting. 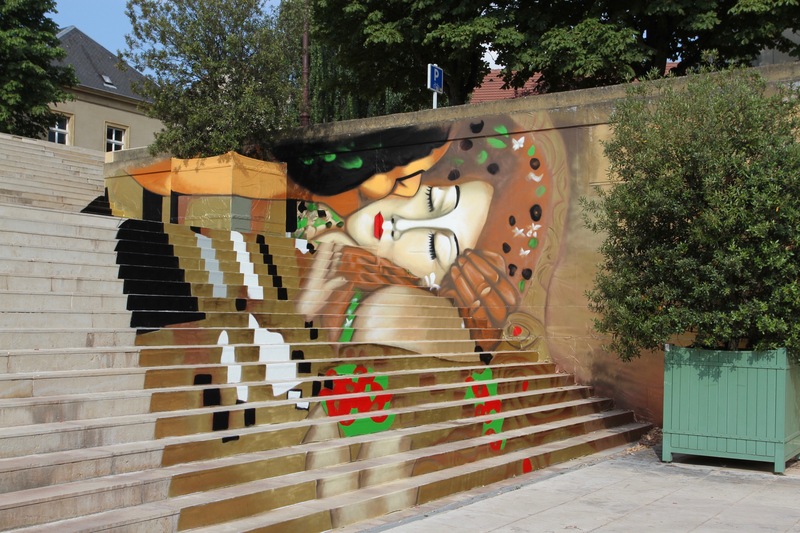 The story goes that when he left Italy for France, he carried with him the Mona Lisa. 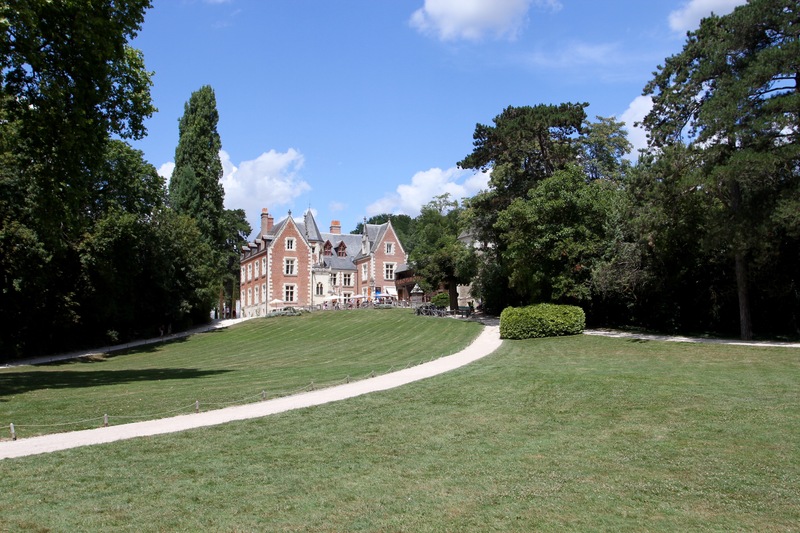 It would be fair to call Leonardo one of the most influential painters of all time, but as a visit to the Clos Lucé proves, he was a man of many talents. He had an endless thirst for knowledge that led him to become an expert in many disciplines, including engineering, botany, architecture, mathematics and music. A mind never at rest, inventions seemed pour out of him: prototypes of tanks, airplanes, helicopters and an adding machine. 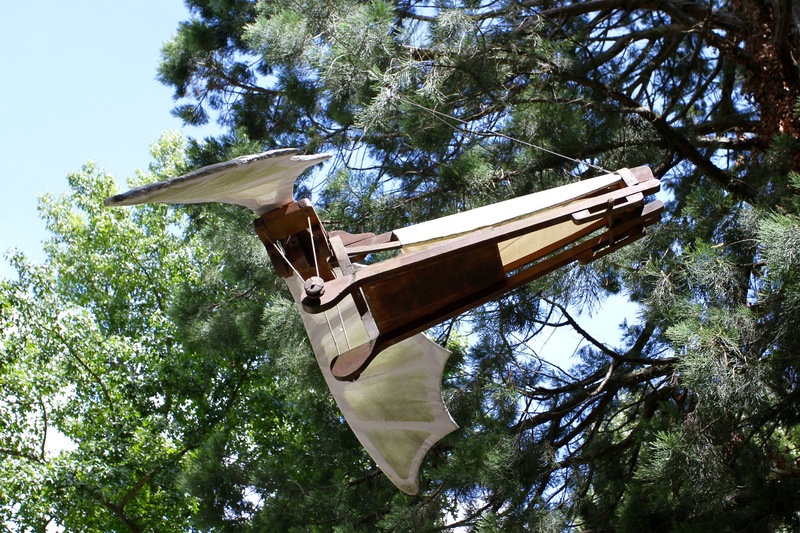 Not to mention musical instruments, water pumps, bridges, the parachute, sculptures and anatomical studies. It wouldn’t be unfair to call him a genius. Yet despite all of this, it is Leonardo the artist that is most popular. The Mona Lisa may be the most well known piece – and he was still working on it when in Amboise – but it’s the 1490s painting of The Last Supper that is his true masterpiece. 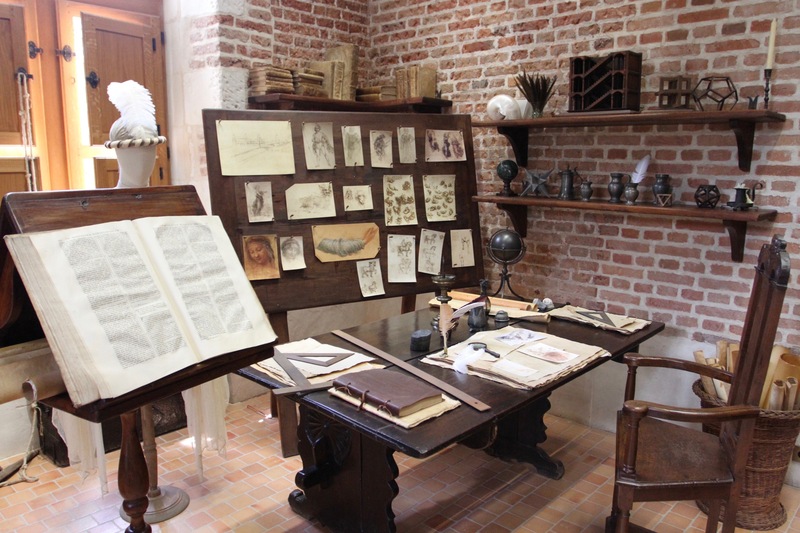 All of these different aspects and periods of Leonardo’s life are covered at Clos Lucé, and perhaps it is testament to his enduring popularity that when I arrived at the entrance (dripping in sweat) there was a queue of thirty people. In fact, the whole of the magnificent gardens and the period interior of the house were packed with people. I was so hot that once I had my ticket I headed into the gardens and the shade of some nearby trees. 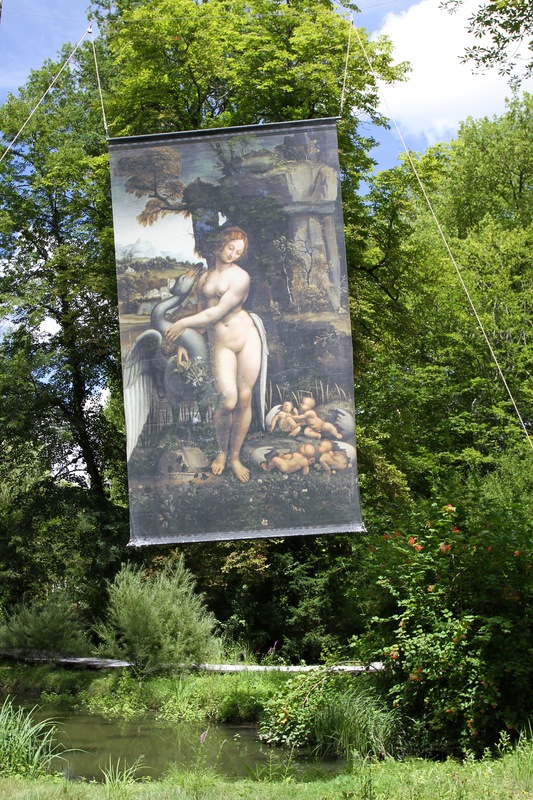 There is a trail that leads around the gardens, and I followed it past reproductions of various inventions and of his drawings and paintings hung amongst the trees. 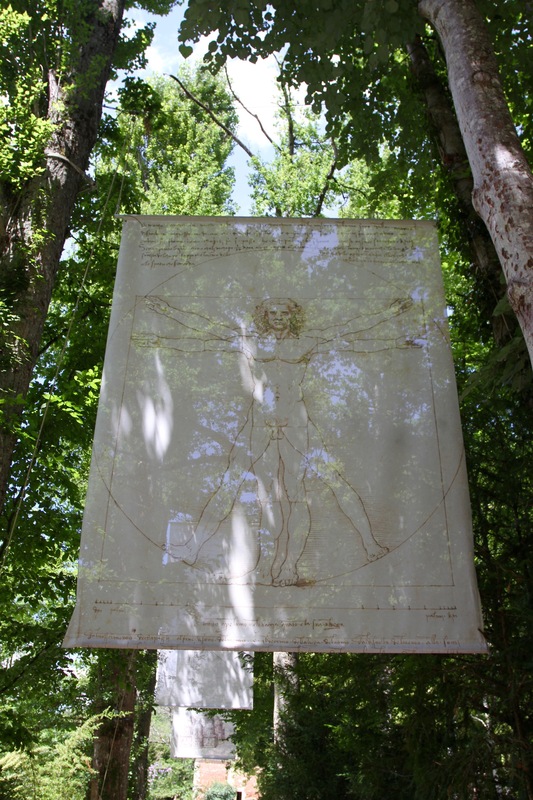 The mysterious eyes of the Mona Lisa could be seen peeking between trees in a shady glade. Although there were a lot of people, the gardens were quite peaceful, and I spent a good hour meandering around before plucking up the courage to go into the house. There are some fascinating displays and lots of good information about the man, his times, and his work. It was crowded though, and the heat was suffocating. I rushed my visit just to get back outside and into the shade of a tree. 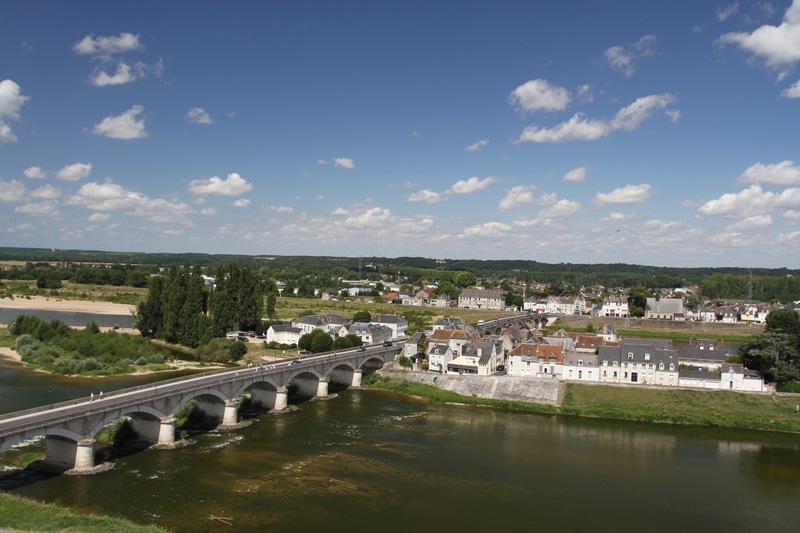 Afterwards, I strolled back into the town and along the banks of the River Loire. In the end, I had to give in to the temptation of the air conditioner, and went to cool off at the hotel. Later that evening I had a table booked at the restaurant Chez Bruno, run by the same people who run La Cave. 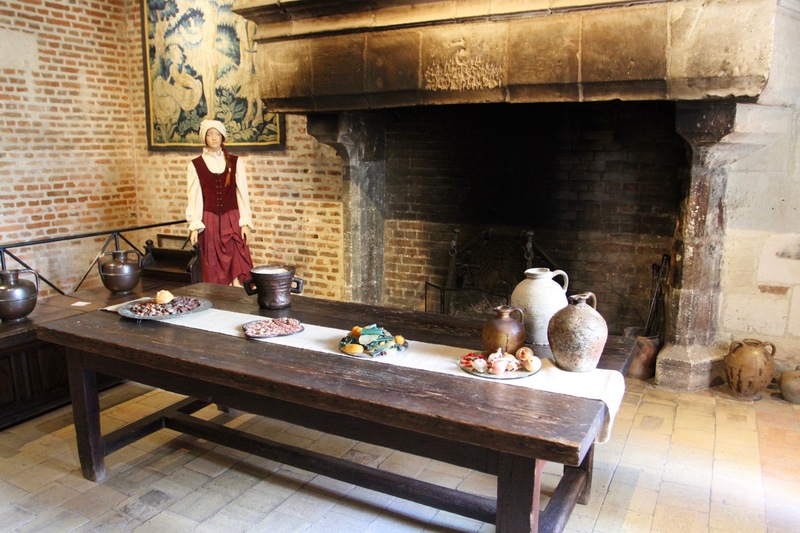 As well as a well stocked cellar, they do excellent food. It felt like fate that, just a few days before we would leave the Netherlands for Germany, a Dutch couple sat at the next table. We struck up a conversation and shared a few glasses of wine. A fine end to a well spent day. 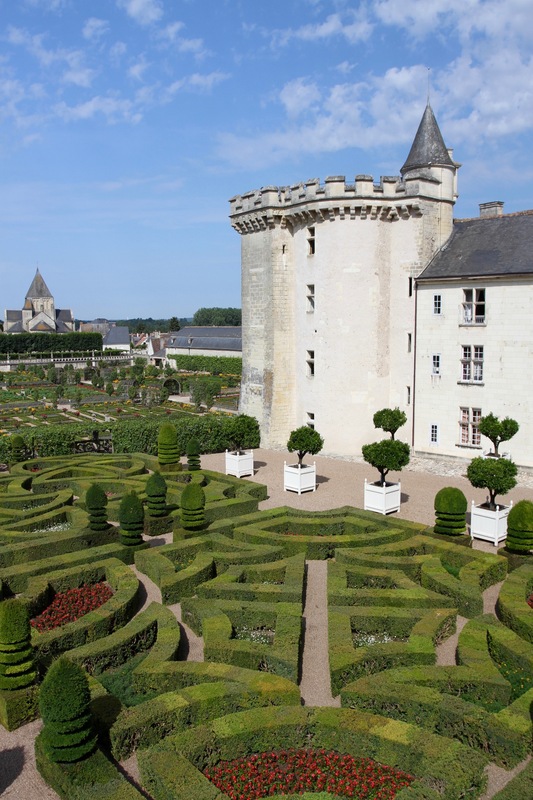 The Loire Valley is a magnet for anyone who wants to immerse themselves in France’s royal history. 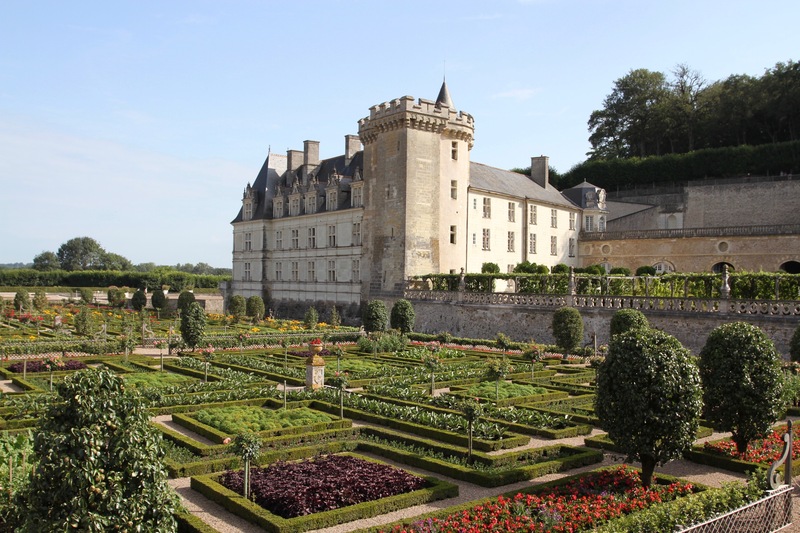 The lure of the majestic River Loire, beautiful countryside, picturesque towns and villages, and dozens of glorious chateaux with their frequently scandalous pasts, not to mention their lavish formal gardens, is overwhelming. This is one of the most historic and popular regions in the country, and it attracts tourists in their droves. To emphasise the point, UNESCO designated a 300km stretch of the valley as a World Heritage Site in 2000. 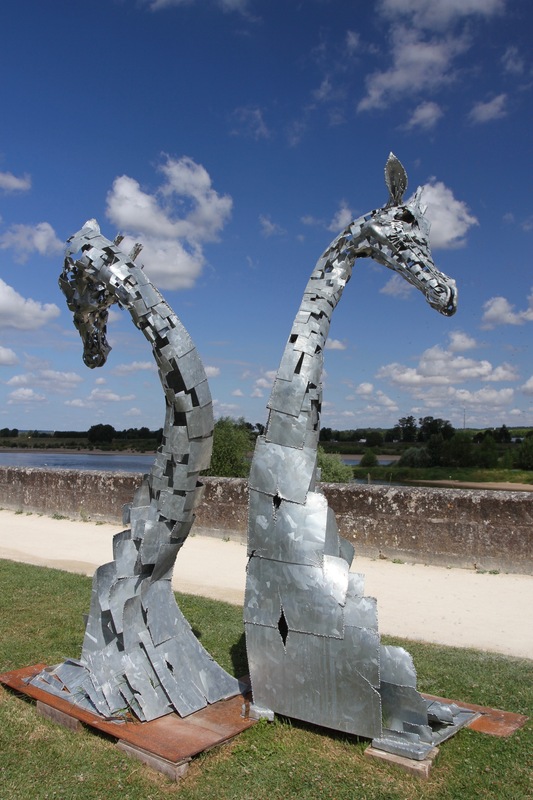 We last visited the Loire a couple of years ago, but didn’t have time to visit Amboise. A state of affairs I’ve been eager to rectify ever since I learned of both its royal history and its connection with Leonardo da Vinci. Home to approximately 15,000 people, it’s a relaxed and easy going place despite being one of the region’s premiere destinations for tourism. I found myself there during a mini-heatwave, the temperature reaching 38°C, which may account for why there seemed to be few tourists walking around. 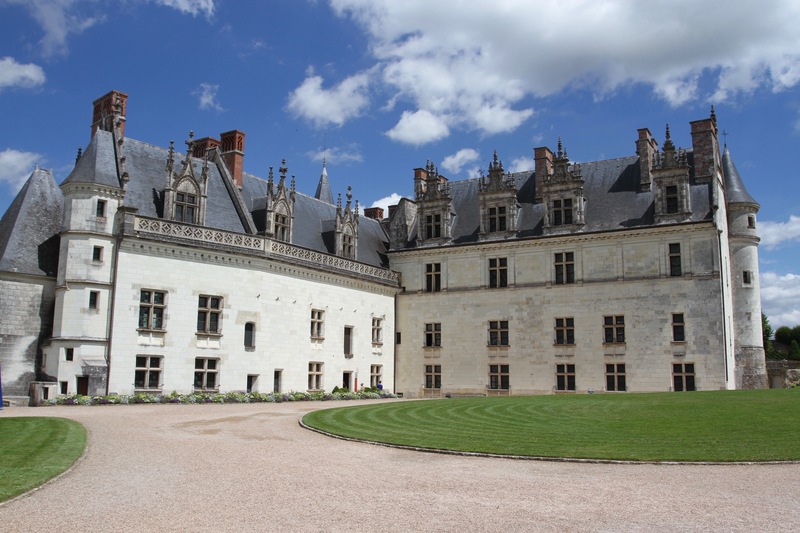 I arrived early in the morning after a drive from Bourges and was able to check into my hotel – always a good sign – before heading off to find breakfast and then making my way to the town’s outstanding sight: the Château Royal d’Amboise. I walked through still quiet streets until I found an open cafe sitting directly beneath the towering walls of the château. The château wasn’t yet open so I made my way to the Pont du Maréchal Leclerc, Amboise’s road bridge over the Loire that also crosses the Île d’Or. From the bridge the views to the town and château are wonderful. The castle started life as a stone keep in the 11th century, but was expanded over the centuries until it was seized by Charles VII after its then owner was accused of plotting against the royal family. 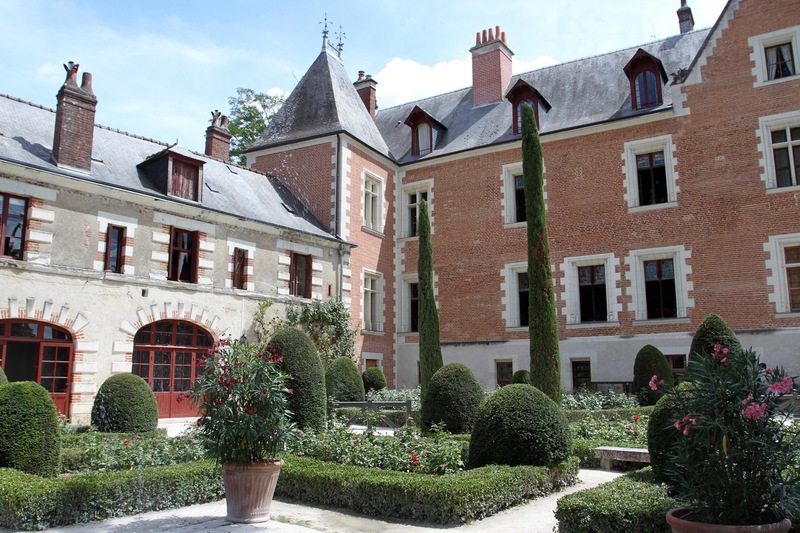 It became a royal residence in 1434 and was a firm favourite of French kings for the next 150 years. 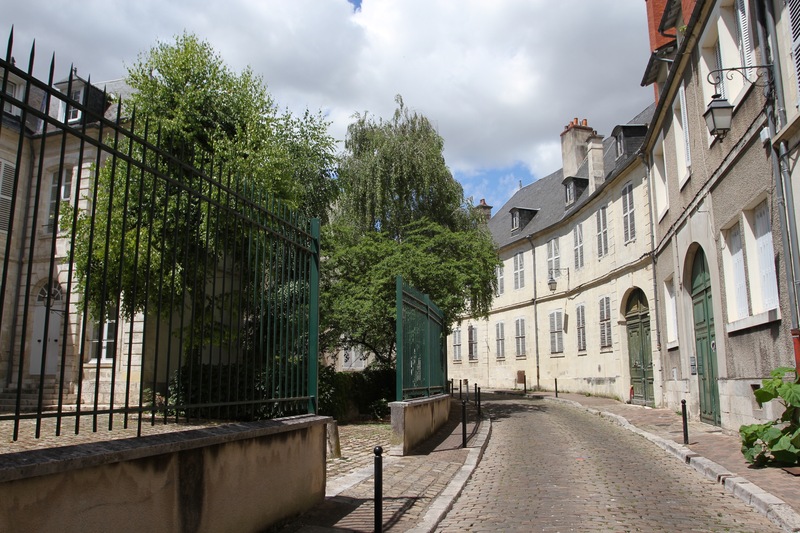 Charles VIII even went as far as to die here – by hitting his head on a wooden lintel when on his way to play tennis. It was during the 16th century reign of Francis I that the castle reached it’s pinnacle. 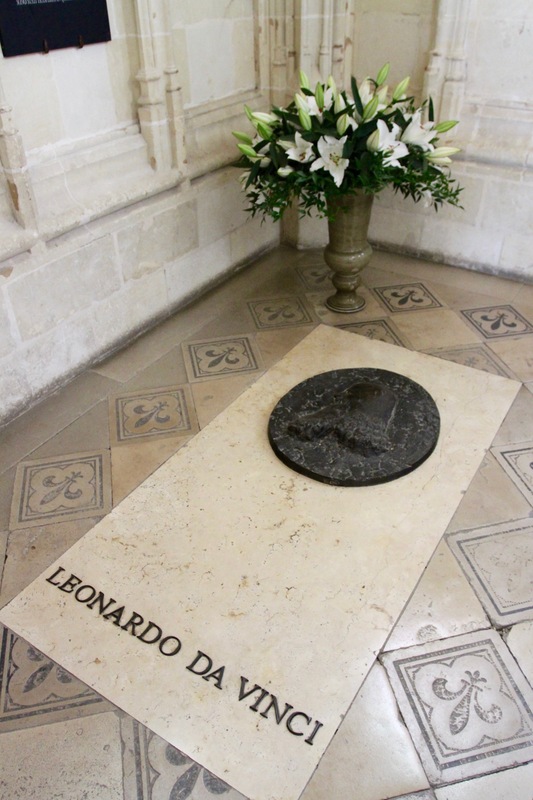 It was to Amboise in 1516 that Francis brought Leonardo da Vinci, and it was here that the Italian died in 1519. 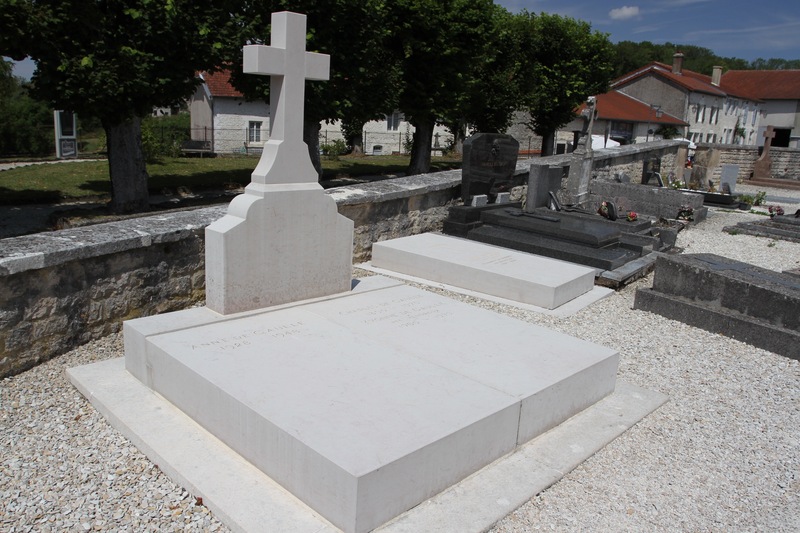 His grave lies within the Chapel of St. Florentin in the grounds of the Château d’Amboise. 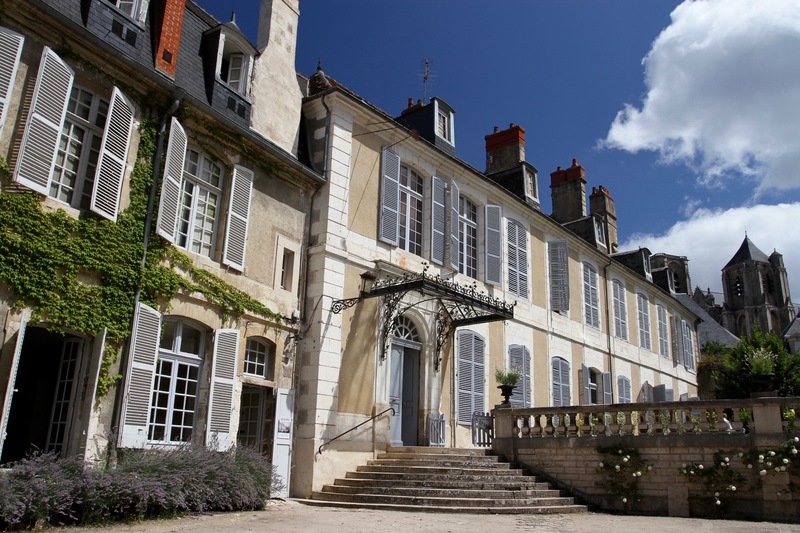 It is one of the first buildings that visitors to the château see when entering the grounds. The interior is very simple, with just a few stained glass windows adding a splash of ornamentation. I decided to walk through the grounds before visiting the castle interior, I was glad I did as the temperature got uncomfortably hot as the morning went on. During the reign of Francis I there were many more structures than today, several 16th century buildings didn’t survive into the modern era. Demolished in later centuries, the space left behind became the extensive formal gardens. What remains, although not a patch on the 16th century château, is still impressive and the grounds are very pleasant. The heat by late morning was unbearable, so I headed indoors to explore the château. The castle has seen many famous ‘guests’ including Mary Queen of Scots, who at least was here of her own free will. 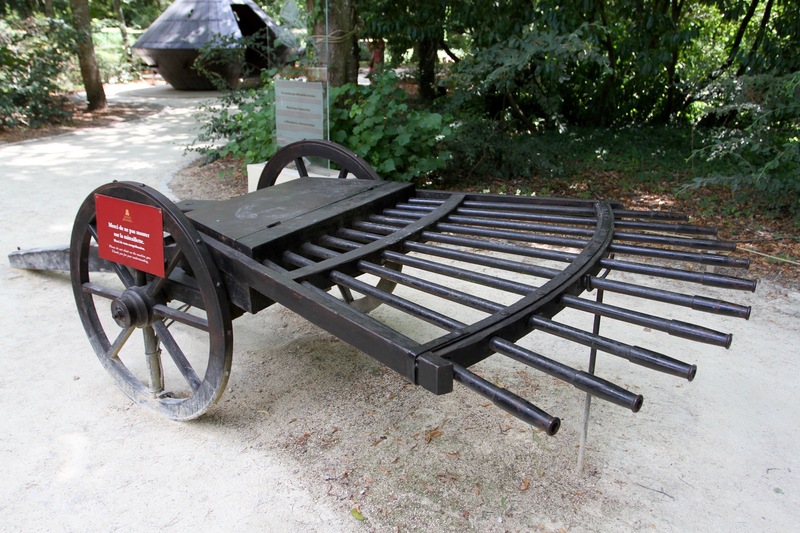 Louis XIV turned it into a prison, a role it continued to serve until the 19th century. 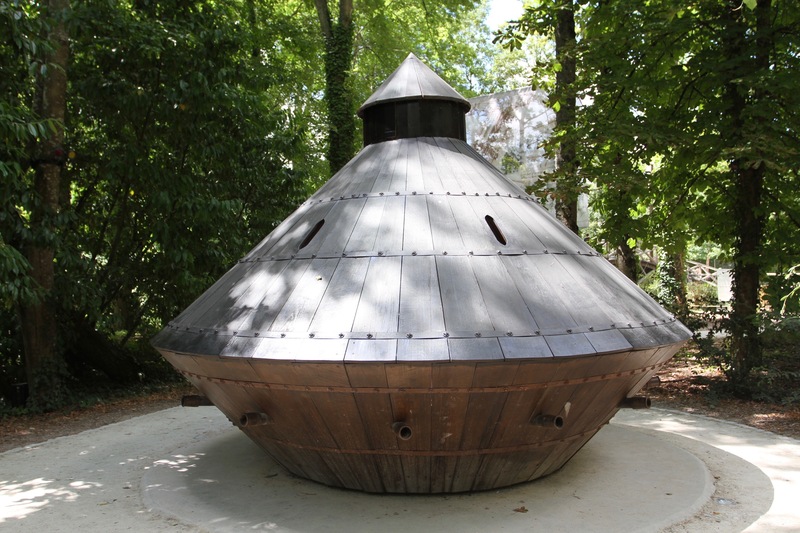 It was here that the Algerian Emir Abd Al-Qadir and his family was imprisoned in 1848, for his role fighting French colonisation of his country. The château has some furnished rooms, but many are quite bare. It doesn’t take long to go around it. While it remained a royal residence, after Francis I successive monarchs spent less and less time here. 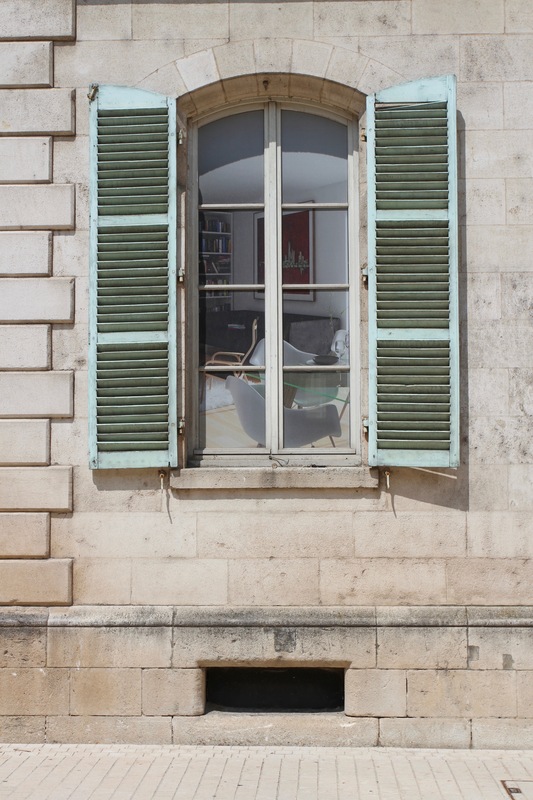 Without the royal court visiting on a regular basis many buildings were unused and fell into disrepair. The nail in the coffin came during the French Revolution, when many decrepit buildings were destroyed. It seems a shame, but it’s compensated for by the extraordinary views over the valley below. From the battlements you can probably see Mick Jagger’s house. 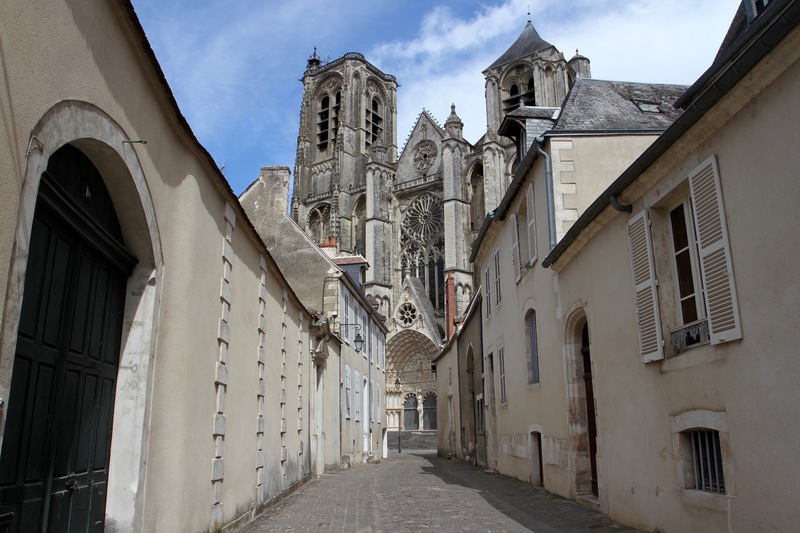 Bourges is an ancient town, with a history dating back millennia. It was the capital of the Celtic Bituriges tribe, and an important political, economic and military centre in pre-Roman Gaul. Known as Avaricum, in the winter of 52 BC it attracted the attention of Julius Caesar, sent from Rome to crush the rebellion that had broken out amongst Gallic tribes united under the leadership of Vercingetorix. After initial success, the Gauls were forced to adopt guerrilla warfare to avoid a head on battle with Caesar’s formidable army. Avaricum was at the time the largest and best fortified town in Gaul. 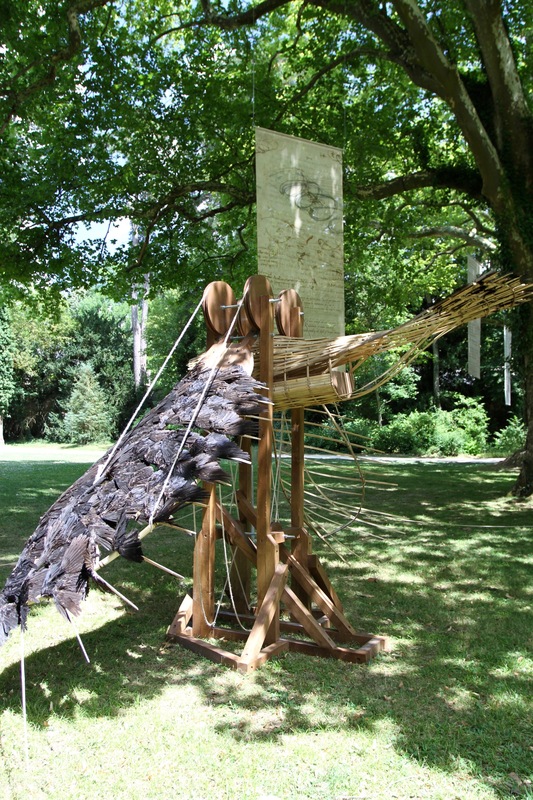 Caesar laid siege to it and built an ingenious siege engine to breach the walls. It’s estimated that in the bloody massacre that followed only a few hundred of the 40,000 inhabitants were spared death. Despite still having an army of 80,000 the end was in sight for the Gallic rebellion. Defeated at the siege of their last stronghold, Alesia, Vercingetorix was captured and taken to Rome to be displayed as a prize of war before being executed. 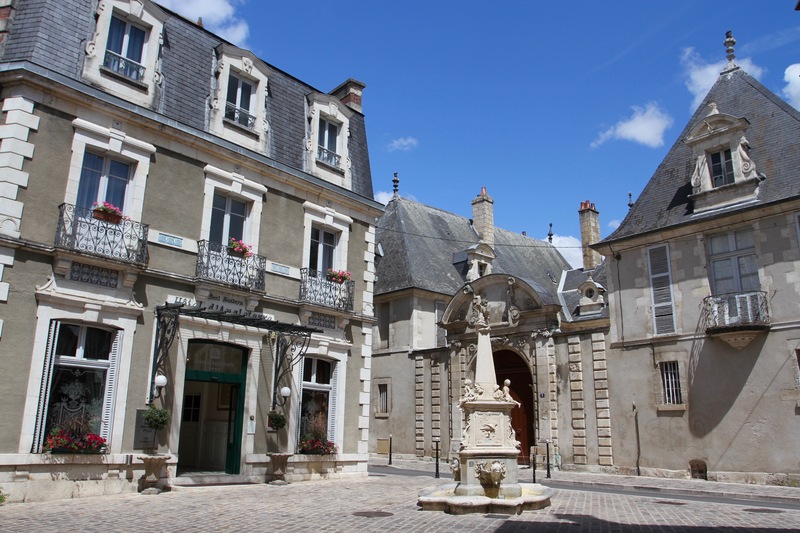 Centuries later, between 1422-37, the town was home to King Charles VII who, with the assistance of Joan of Arc, liberated contemporary Gaul from the English during the Hundred Years’ War. Joan stayed in the town in the winter of 1429-30. 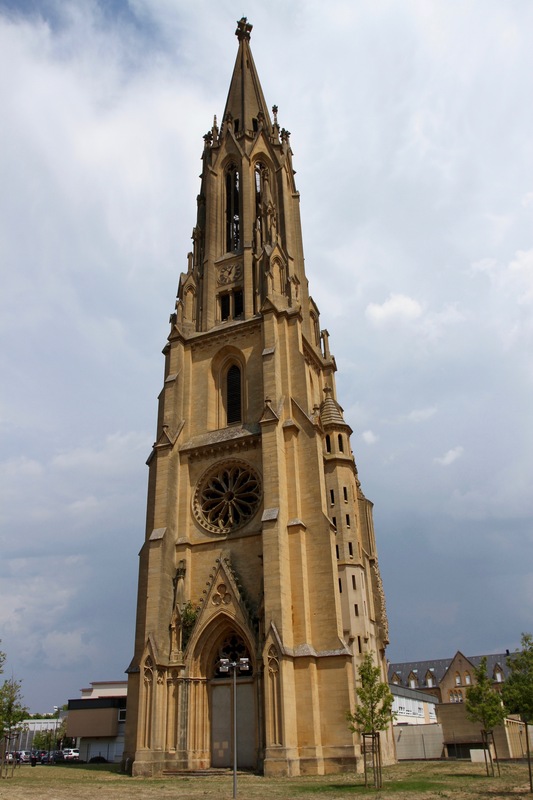 It was Charles VII who raised Bourges’ most famous son to prominence following the end of the war. Jacques Coeur was a trader and a very wealthy man. He became a banker to the royal court, a member of the king’s council and was something of a legendary figure of the era. His position of influence with the king made him even wealthier, as did his pioneering trade deals with countries around Europe and the Mediterranean. Vast wealth and fame brought him many friends, and even more enemies. When his luxurious lifestyle made even Charles VII envious, he was framed for the murder of Charles’ mistress, Agnes Sorel. He escaped imprisonment and fled to Rome, where he took command of a naval expedition against the Turks, dying in 1456 during a battle in the Aegean. Over the centuries, his life and death became the stuff of legend, and gave credence to his family motto: To a valiant heart nothing is impossible. 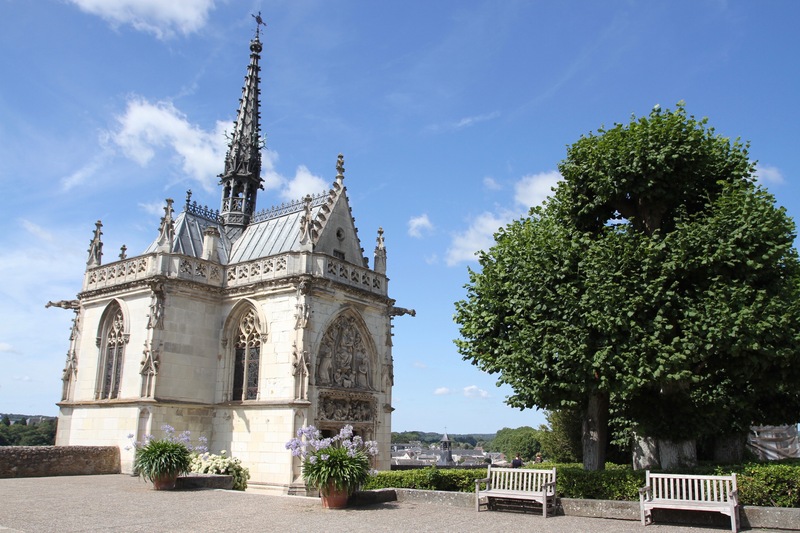 His glorious, sumptuous Gothic palace in the heart of Bourges is open to the public and is well worth a visit. 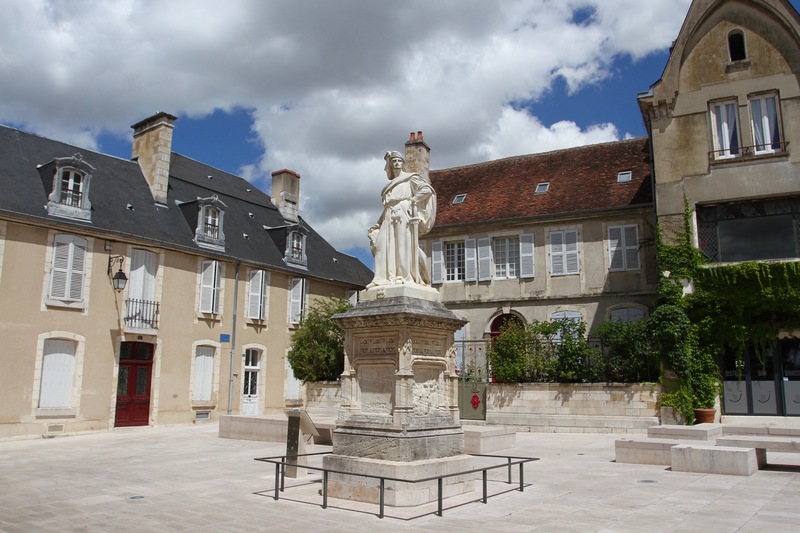 Outside is a small square with a romanticised statue of Coeur dressed in some of the silks he traded around Europe. Inside it’s quite plain, with few furnishings from the period. To make up for this, there was a temporary exhibition of slightly bizarre video art. 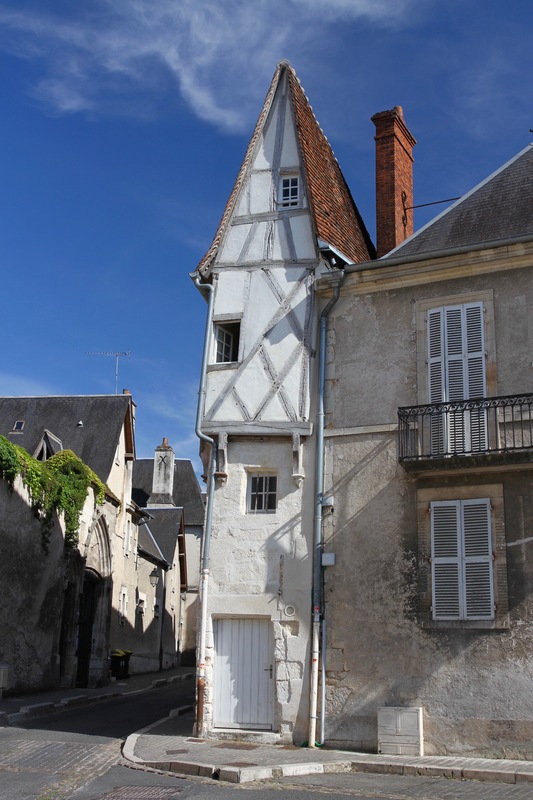 Of Bourges’ many historic associations, one other stands out. It was when studying law here in the 1520s that John Calvin was converted to the reformist religious ideas of Martin Luther. Calvin had originally been studying to join the Catholic priesthood, but his form of Protestantism would go on to have a major impact on the world. 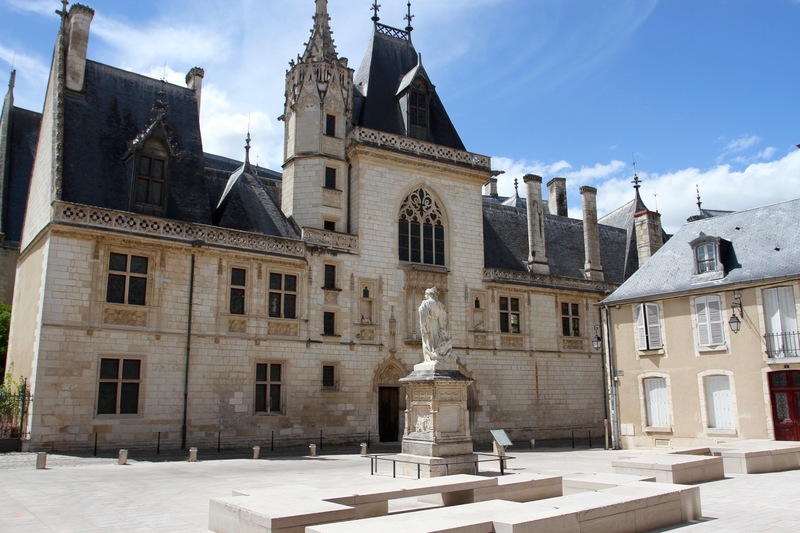 All this history, plus a wealth of historic buildings and several good museums, should mean Bourges is a tourist hotspot. Yet even at the Jacques Coeur Palace I saw only a handful of other tourists. 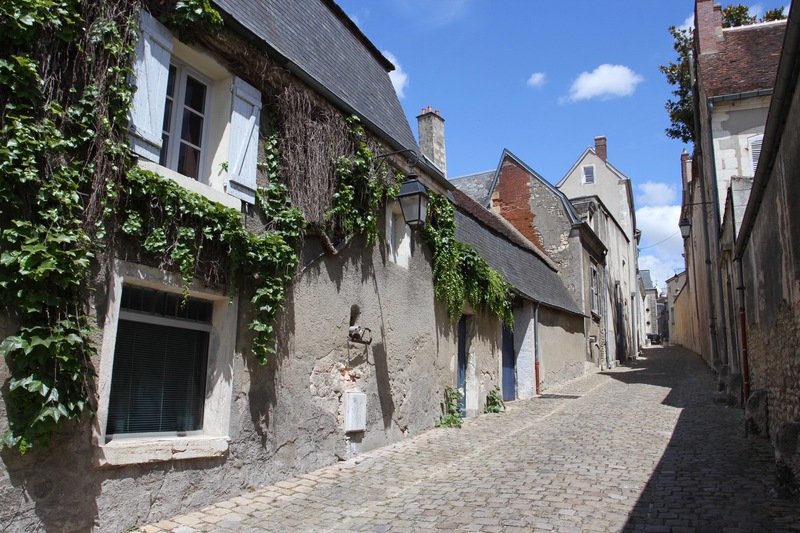 I stayed in Bourges for a couple of days and spent my time wandering the narrow lanes and picturesque streets. 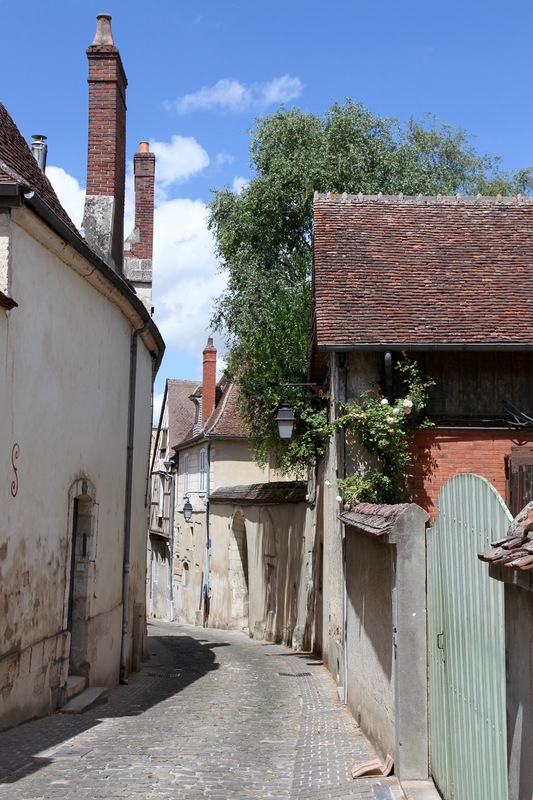 There are half-timbered houses dotted around, many of them on a walking route around the town. 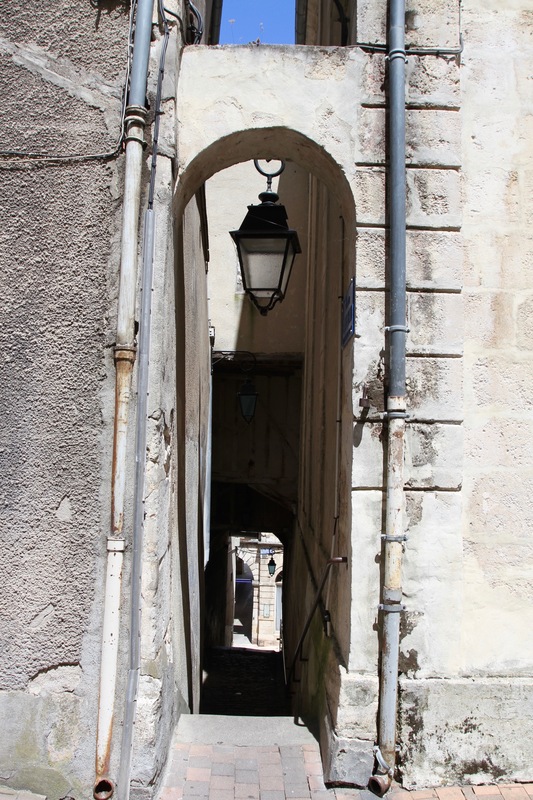 The walk takes you along the old ramparts, as well as through back alleyways and steep stairways between the upper and lower towns. 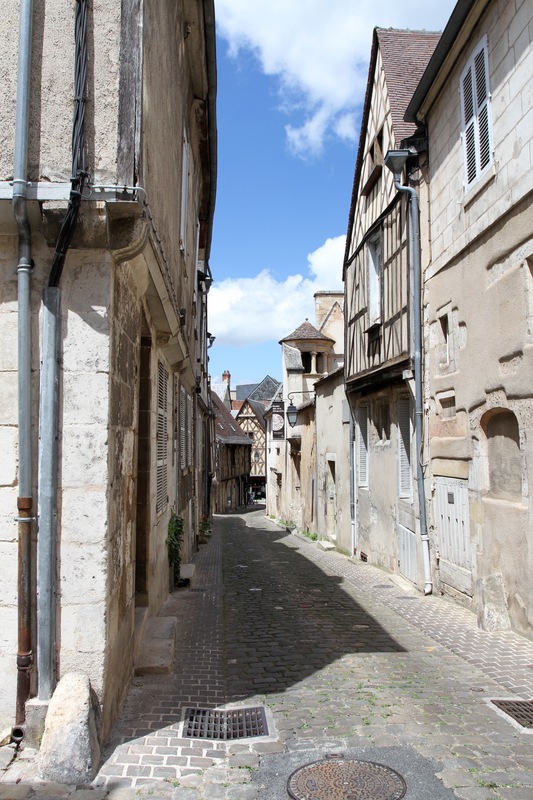 The streets were often empty of people as I meandered around, giving me a sense that in Bourges, time stands still and is only occasionally interrupted by the modern world. The manager of my hotel had recommended a restaurant in the square next to Jacques Coeur’s former palace. So, on my final evening in the town, I sat at an outside table and watched the sun set in the shadow of the great man’s statue. It was a fantastic end to my time in this wonderful town. 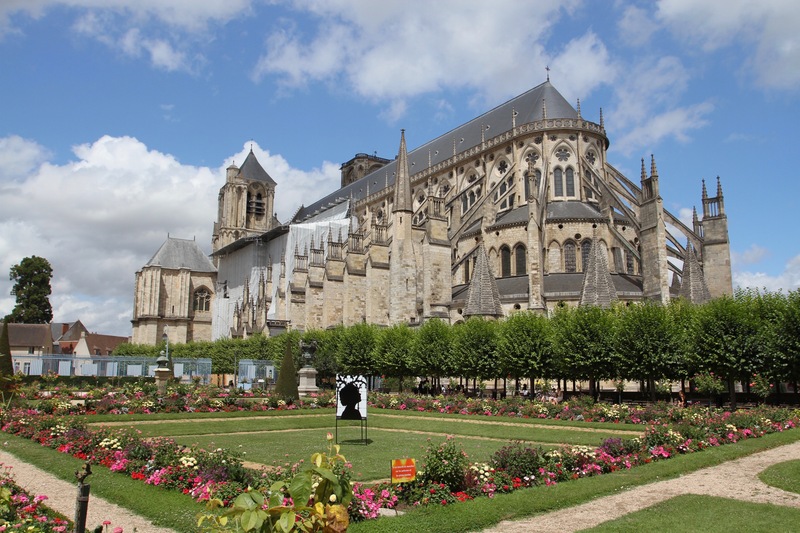 A couple of hours after arriving in Bourges, I was standing in the colourful gardens next to the utterly magnificent Cathédrale Saint-Étienne de Bourges. Photographs can tell some of the story, but you really have to be there in person to understand the scale and majesty of the building. Strangely, it wasn’t the cathedral that was occupying my mind. Instead, I was struggling to reconcile the glorious city I found myself wandering around with the fact that I seemed to be the only tourist to have shown up that day. This itself was cause for conflicting emotions. 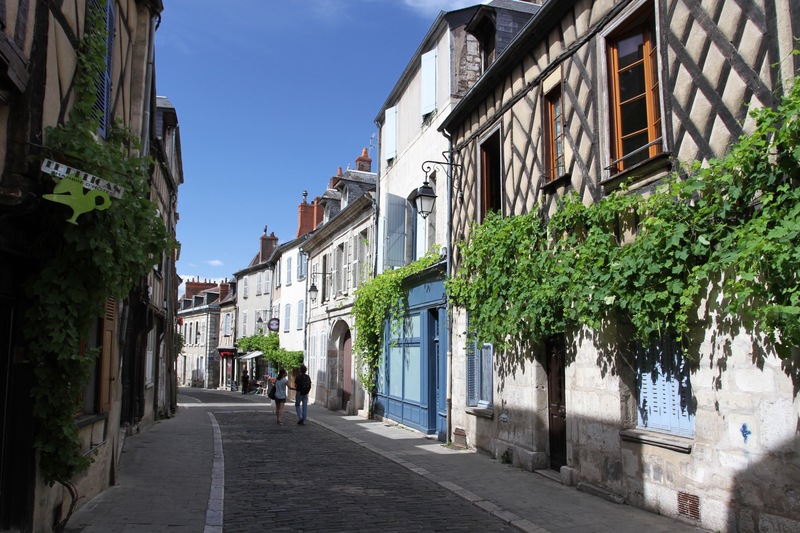 Bourges is a town filled with riches that richly deserves to be on the tourist trail, yet I couldn’t help but be selfishly grateful for the town’s unfortunate location. 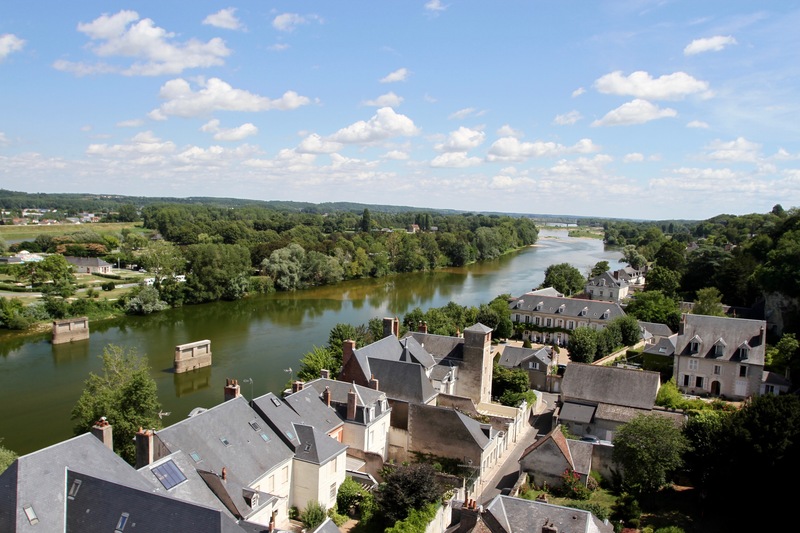 A little too far from the Loire Valley’s industrialised tourism, and more than just a short detour from the southern Champagne region, it seems to sit in a tourism no man’s land. That, I figured, was a problem for other people, and I went inside the cathedral to gawp at its spellbinding stained glass and massive interior space. I only came to Bourges because I’d picked up a leaflet in a tourist information centre on a trip last year. It looked like my sort of place, and then I discovered L’Hôtel de Panette. 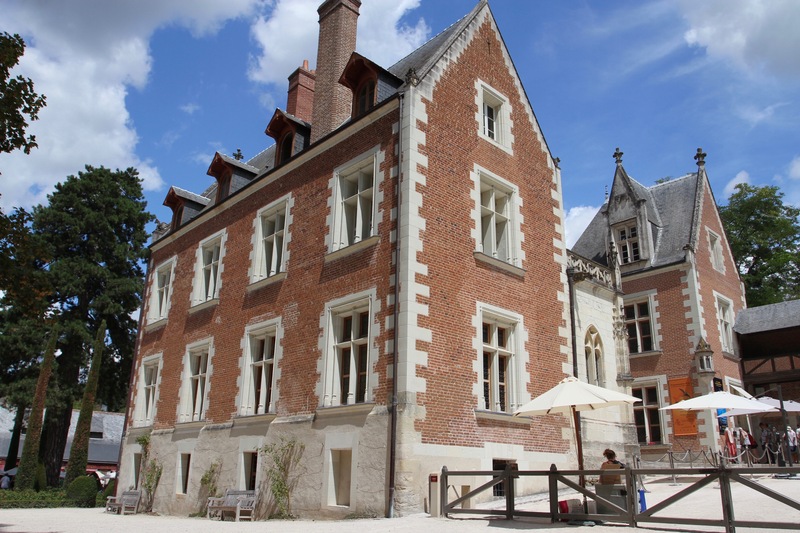 I was trying to keep the costs down on this trip, but the lure of staying in a chateau with an incredible history caused me to splurge for a night. I’m glad I did. The chateau dates from 1418, when it was residence of the Treasurer of Bourges. It passed through many hands until it became residence of the exiled Bourbon ‘King of Spain’, Charles V.
Don Carlos, as he was known, was a reactionary and out of step with the times. When his elder brother died, he tried to claim the throne but met with fierce resistance. 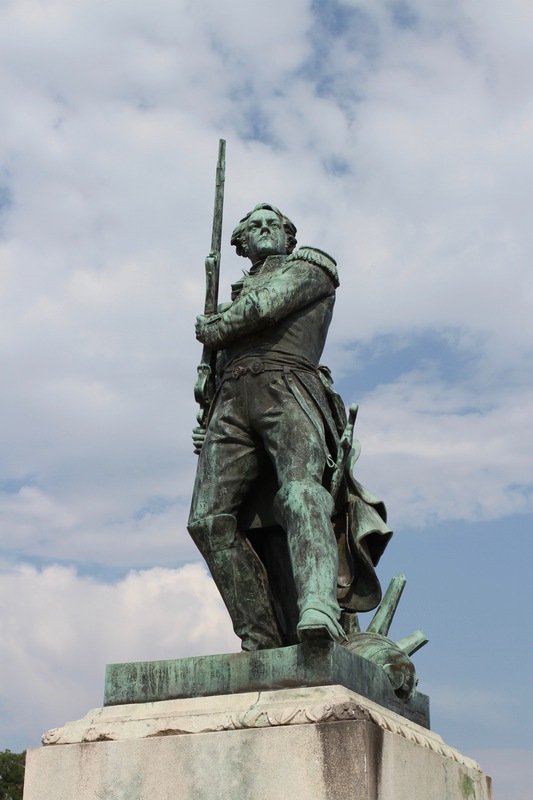 This resulted in the The First Carlist War of 1833-40, which ended in defeat for his forces. He fled to France where he was ‘imprisoned’ for five years in the L’Hôtel de Panette, which acted as a de facto court in exile. This can’t have been much of a hardship, or that unusual for him – Napoleon had him and his siblings imprisoned in France during the Napoleonic Wars. 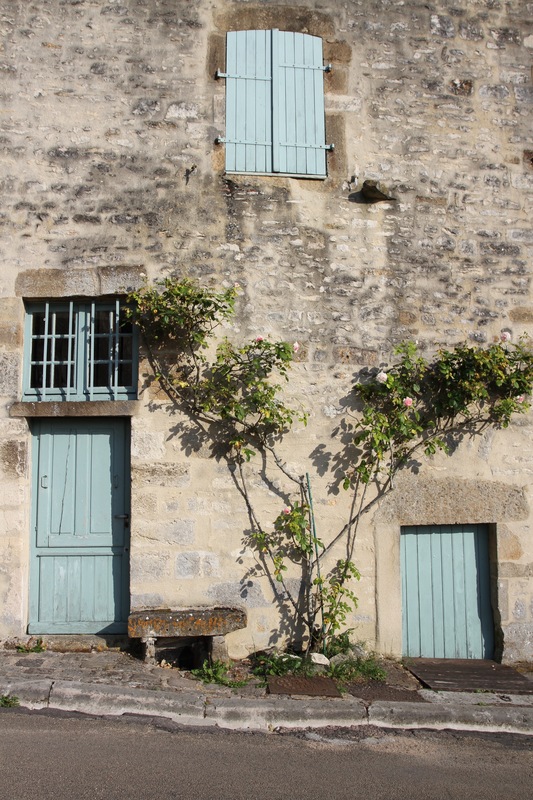 Today, the L’Hôtel de Panette has several rooms and is a very stylish B&B. It may not be the cheapest option in Bourges, but it is definitely worth every cent. If you really want to splash out, you can stay in Don Carlos’ former bedroom. I checked in and went out to explore the city. The cathedral was my first destination. I approached down a narrow lane, over which the cathedral towered. I’ve become used to finding exquisite churches in sleepy French towns, but it was obvious that this was in a different category. 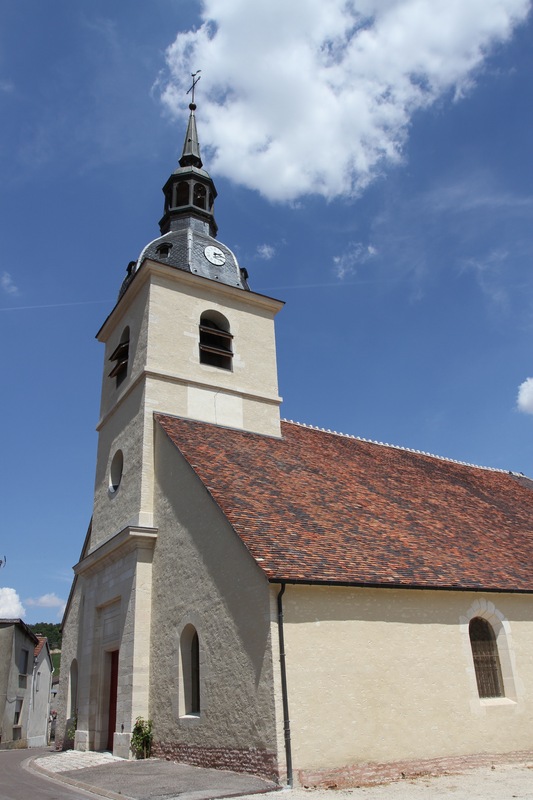 A Christian temple has been on this site since the 3rd century, but the current building dates from 1195. 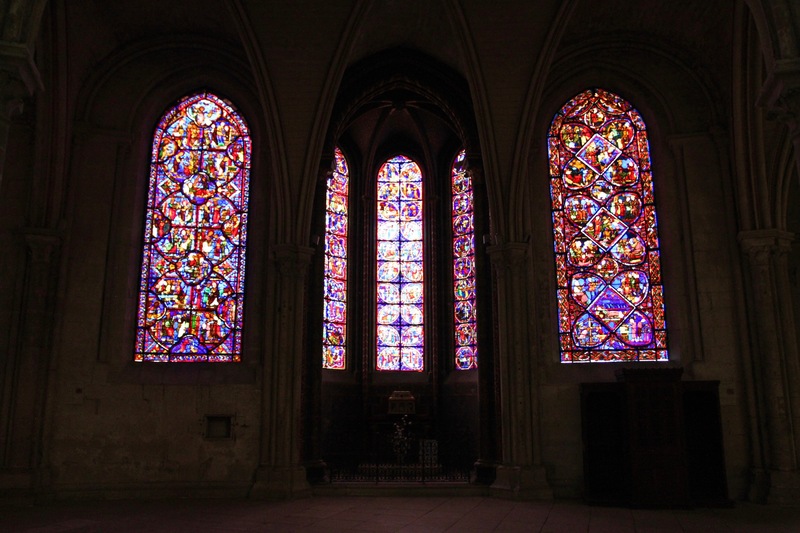 The most remarkable thing about the cathedral, once you get over its immense size, is the fact that it retains the majority of its original stained glass, dating from 1215. Given the turbulent times the cathedral has witnessed, that really is a feat. It’s now an UNESCO World Heritage Site, described as “one of the great masterpieces of Gothic art … admired for its proportions and unity of its design”. It’s hard to disagree. I finally tore myself away from the cathedral and went looking for lunch. Just behind the cathedral is the Rue Bourbonnoux, a quiet pedestrianised street that is home to several excellent restaurants. 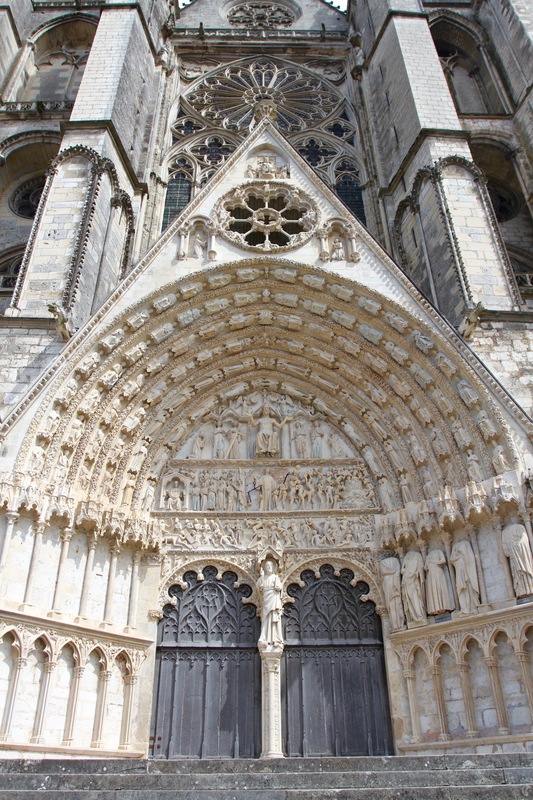 I had a set lunch in a very good bistro and, fully rested, set off again to explore more of Bourges. 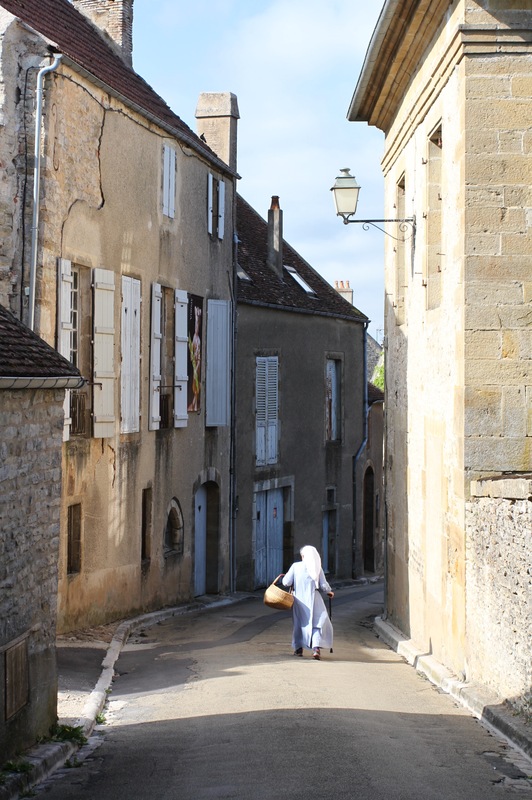 Vézelay is an exquisitely picturesque village perched on a jagged hill with spectacular views over the valley below. 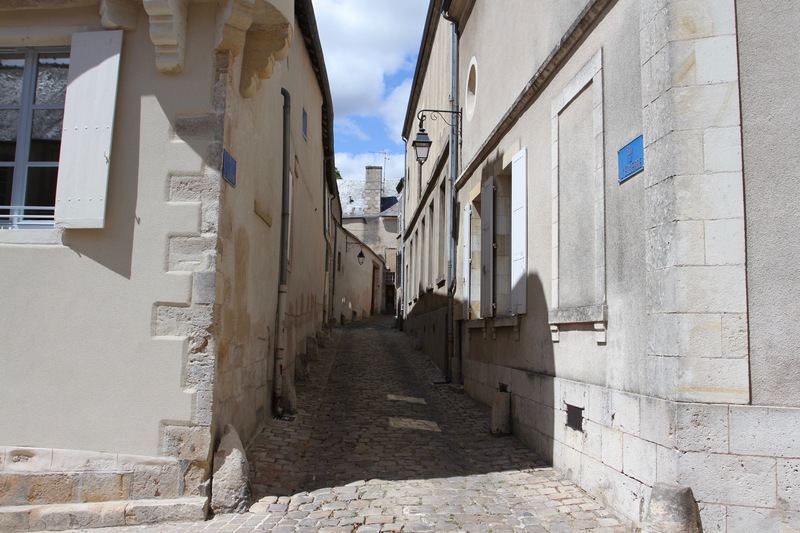 It might not be immediately obvious today, but its quiet, winding lanes have witnessed extraordinary history. 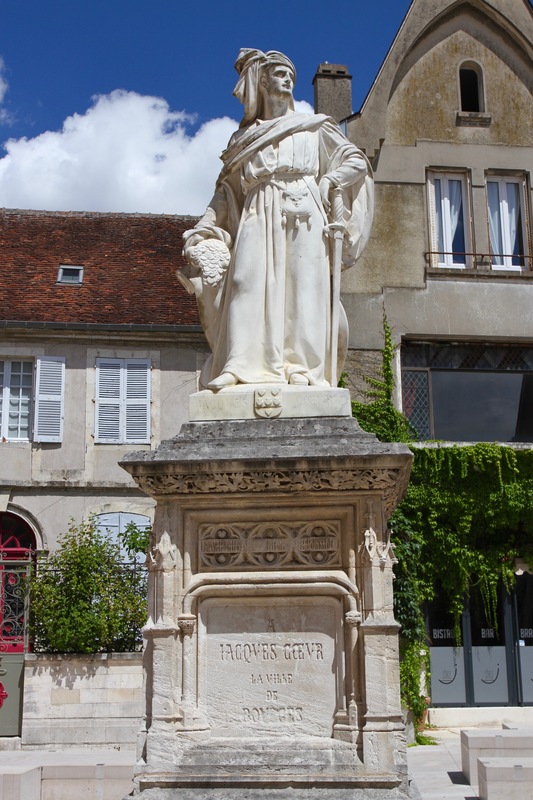 It was here in 1146, that Bernard of Clairvaux, one of the most influential and powerful churchmen of the time, preached the cause of the Second Crusade to support the Christian Kingdoms of the Holy Land. An audience of over 10,000 people included King Louis VII of France. It was a critical moment in winning public support for a crusade that ended in utter failure, and led directly to the fall of Jerusalem to the armies of Saladin. Not the result Bernard had in mind. Vézelay’s crusader connections don’t end there though. In 1190, French King Philippe-Auguste and English King Richard the Lionheart, united their armies here on the eve of embarking on the more successful Third Crusade – it failed to wrest control of Jerusalem from Saladin, but managed to re-establish several crusader kingdoms. 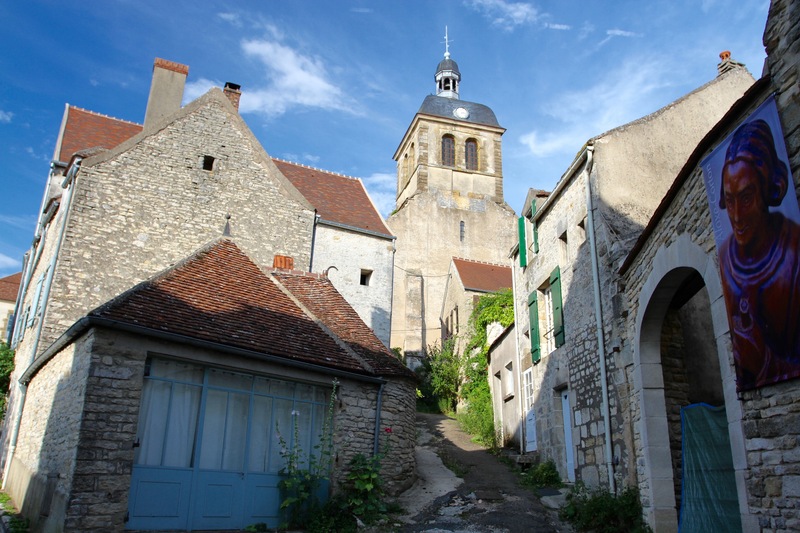 This alone would make the village worth a visit, but this Crusades-related history only happened thanks to the Benedictine Abbey of Vézelay. More importantly, thanks to the Abbey’s association with St Mary Magdalene. Founded in the 9th century, shortly afterwards the Abbey claimed to have acquired relics of Mary Magdalene. One of the most celebrated of Jesus’ disciples, Mary is said to have been present at the crucifixion and that she discovered Jesus’ empty tomb. It was to Mary that Jesus first appeared after his resurrection. 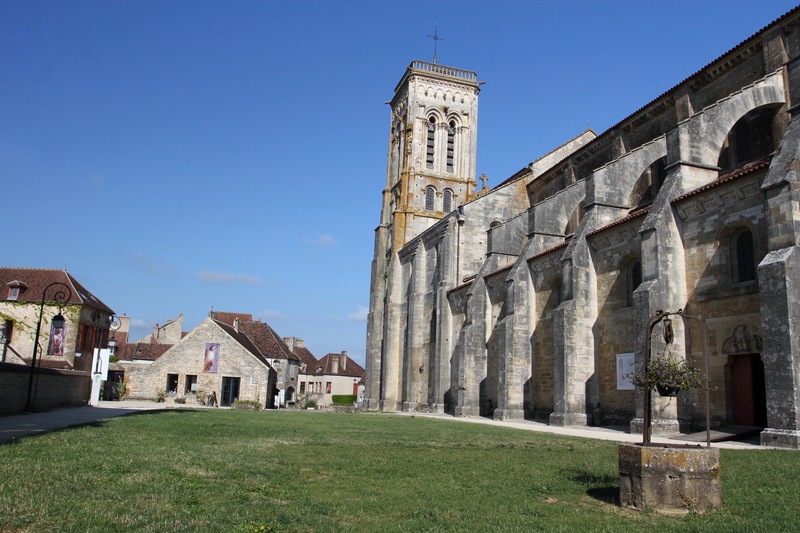 The presence of Mary’s relics was big news (and big business) in medieval Europe, and vast numbers of pilgrims descended upon the village and abbey. Although far fewer in number, pilgrims still come today and there are several guest houses in the village that cater to them. The majority of Mary’s relics were destroyed by Protestants during the Wars of Religion. All that remains today is a finger displayed in a golden case, but even that is disputed as a fake. 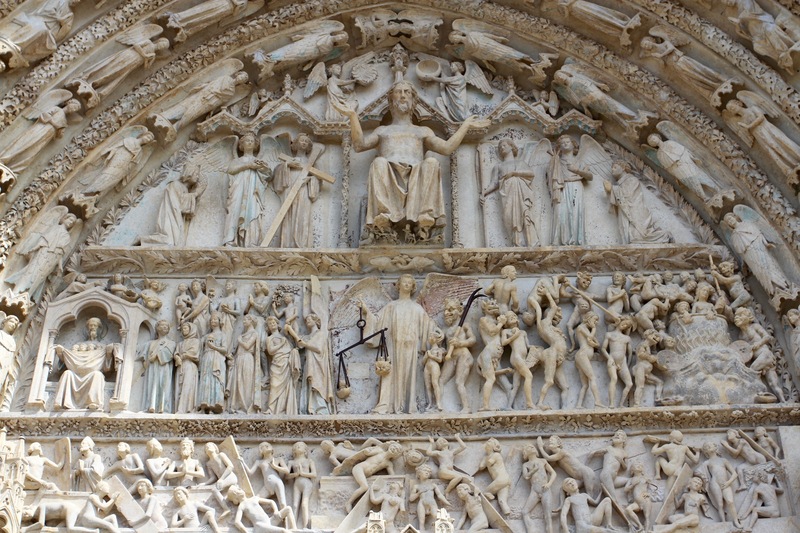 In the 13th century, the village of Saint-Maximin-la-Sainte-Baume in Provence claimed to have the true relics, and this became the official version of the Mary myth. 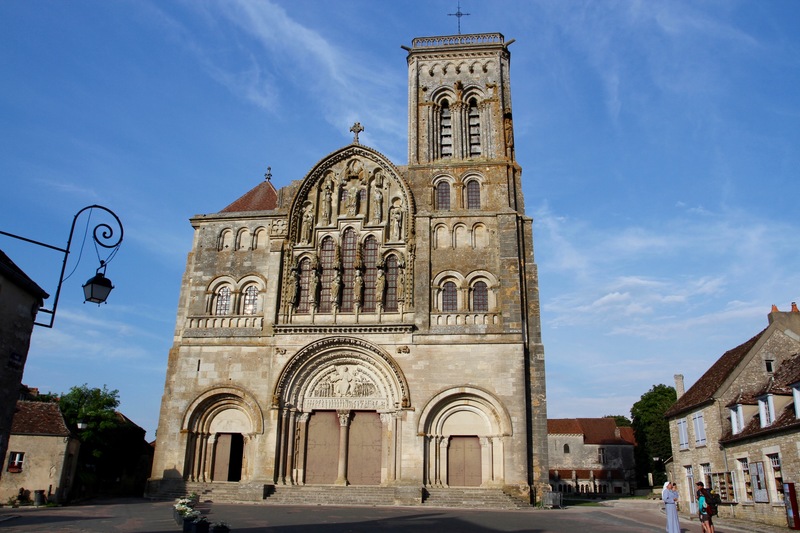 Pilgrims stopped making the trip to Vézelay and transferred their devotions (and donations) to the new relics. 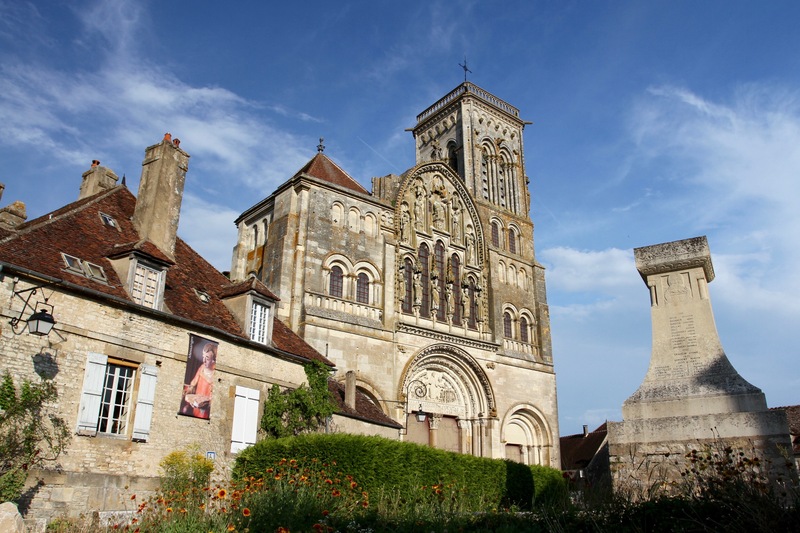 Vézelay’s abbey fell into decline and disrepair. By the 19th century it was close to collapse, only extensive restoration in the 1840s saved it. Today, it is both the crowning glory of the village (it literally sits on the top of the hill), and an UNESCO World Heritage Site protected for future generations. 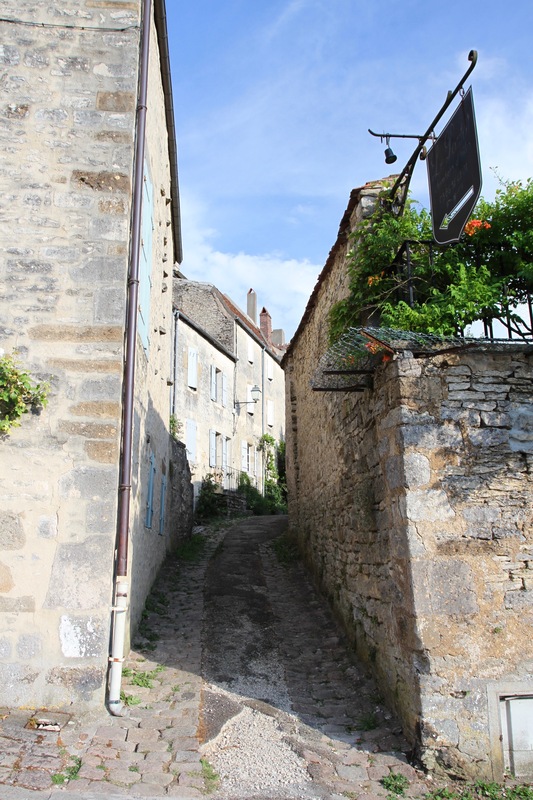 I’d been warned that Vézelay can be swamped with tourists, but when I arrived in the early evening it’s narrow streets were empty and peaceful. In a small place like this I was conscious that most restaurants would be closed by 9pm, so I strolled up to the abbey and wandered down a few cobbled streets before finding a small bistro with outside tables. I ordered a glass of the local chardonnay and drank in the atmosphere and history of this lovely place. The following morning I was up early to explore before the coach parties arrived. The village is built so that it climbs up the ridge of the hill, making it long and narrow. A few streets turn off from the one main road, but getting lost is impossible. 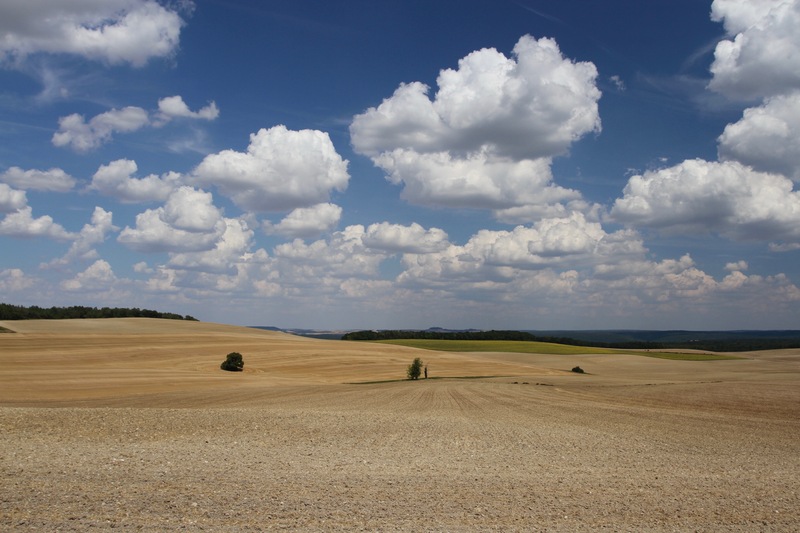 On the flanks of the village, you get beautiful views over the surrounding countryside. 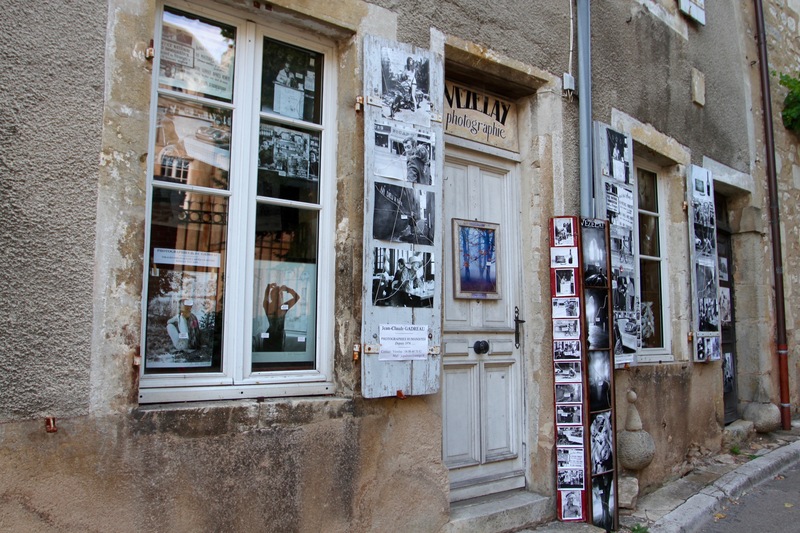 Vézelay has a wealth of historic buildings, many carrying banners of various saints, and a couple of small museums that are worth visiting if you have time. The main attraction though is the Abbey, and it was to there that I headed. Inside was the rather odd sight of some nuns doing the vacuuming. I wandered around, but the interior is pretty plain, although some of the sculptures on the entrance and pillars are fascinating. I found the crypt and the alleged finger of Mary Magdalene, and was then back outside wandering the streets. 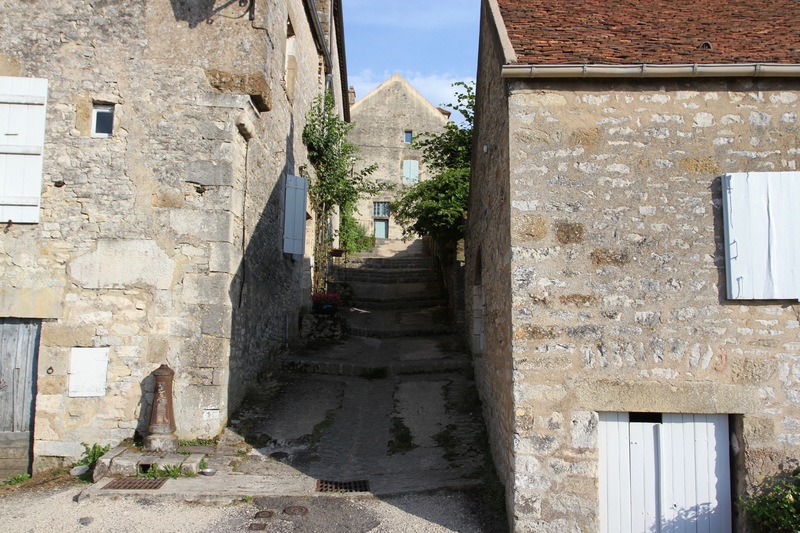 A couple of hours later I had seen the village in its entirety, so hopped back in the car and set off for Bourges. His career, both as a military officer and as a politician, is the stuff of legend. 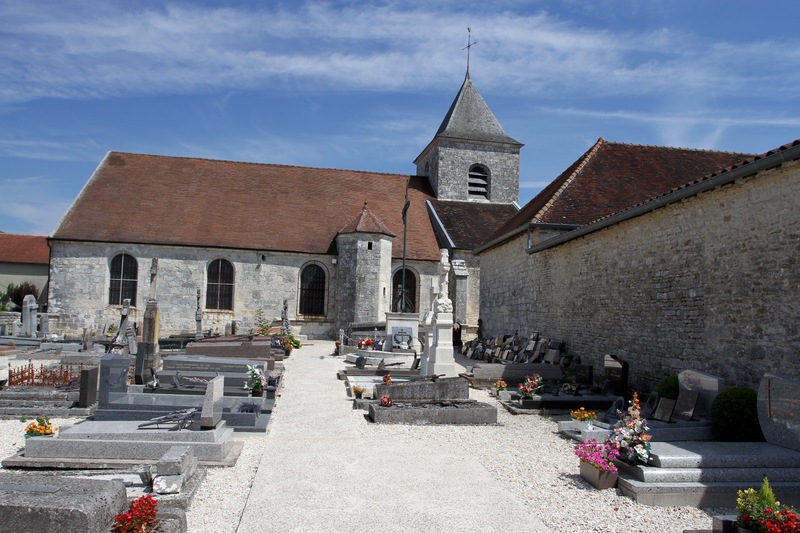 It made a small detour to Colombey-les-deux-Églises, the village where he lived in the final years of his life, and where he is buried, a must. 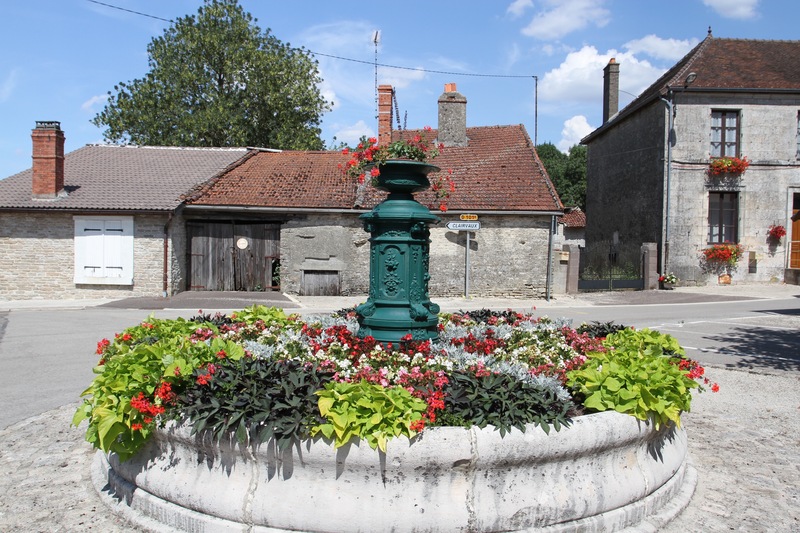 This peaceful little spot is conveniently at the start of the Cote des Bar Wine Route, an area of champagne producing vineyards just to the south of Troyes. 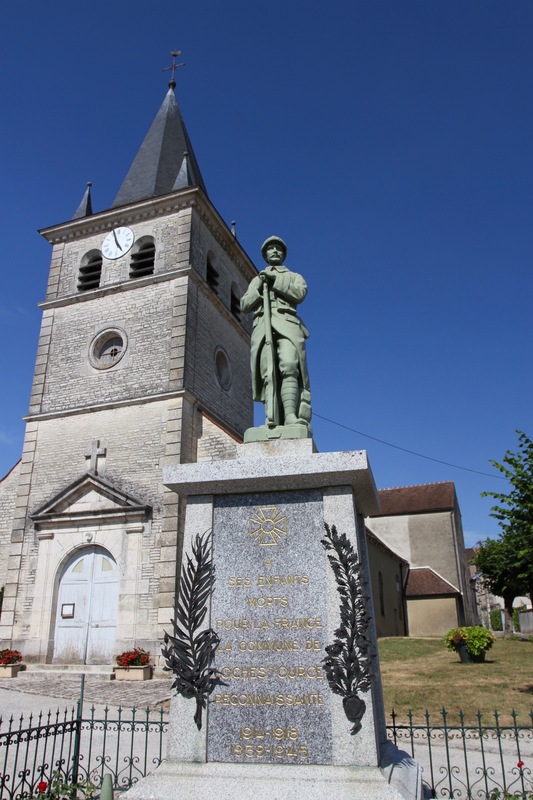 I would follow the sleepy route through lovely countryside and picturesque villages to Vézelay, a dramatic medieval village on a hilltop; but first I’d pay my respects to the General. 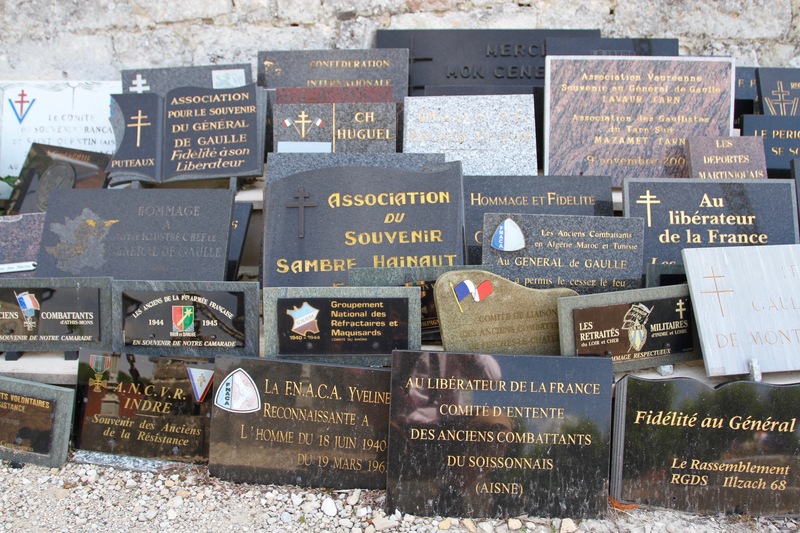 I found the church and cemetery where de Gaulle is buried, it’s filled with tributes to him from all over France. Surprisingly, I was the only person visiting the cemetery, but I figured that most people must be at the de Gaulle memorial just outside of the village, home to an enormous cross on top of a hill. I didn’t have time to visit the exhibition, but I did want to see the memorial. This, a rather embarrassed woman told me, would cost €13.50. She didn’t seem surprised when I decided not to visit. It was a shame, but I had a long drive through champagne country ahead. Easier said than done. 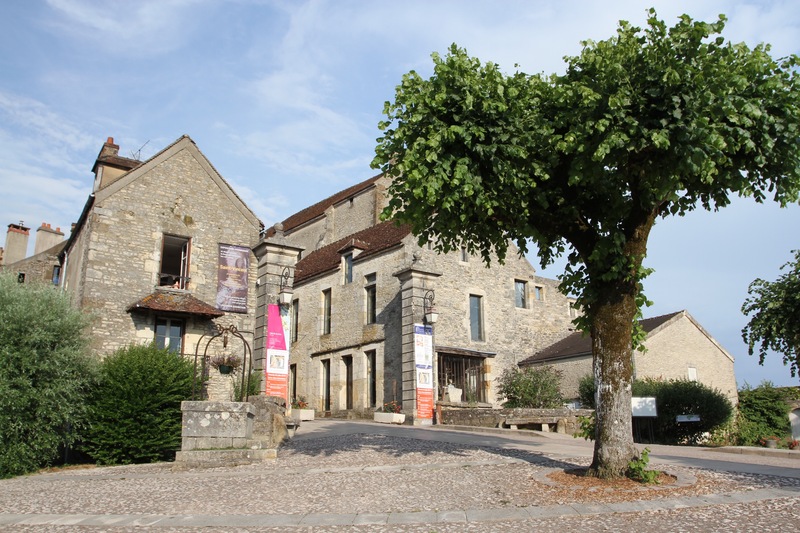 The tourist office in Colombey-les-deux-Églises didn’t have any information, or a map, leaving me with only some sketchy information and a small scale map that I found online. 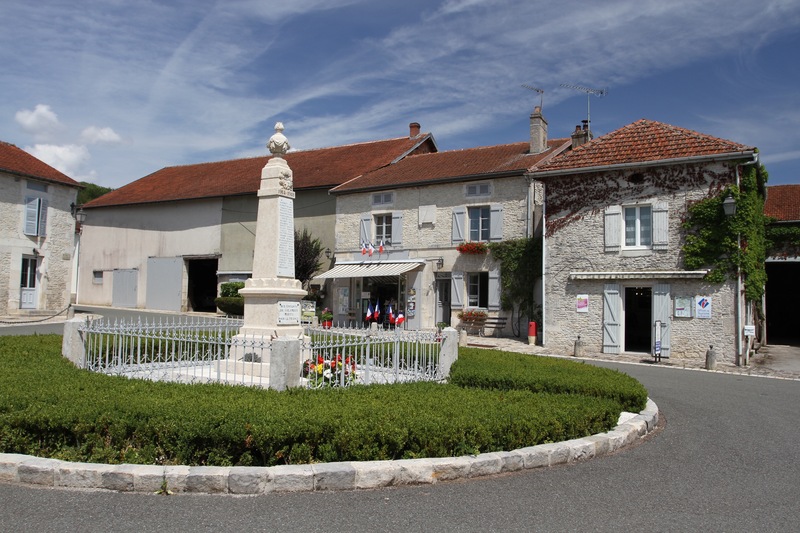 I headed towards the tiny village of Rizaucourt-Buchey, which seemed to be one end of the Côte des Bar champagne route. Here, I hoped to unearth the grape-related road signs I’d seen on other champagne routes to guide me south-west towards Les Riceys, the other end of the route. Under vast skies between these two attractive villages, I came across beautiful rolling countryside filled with vineyards, wheat fields and picturesque villages. 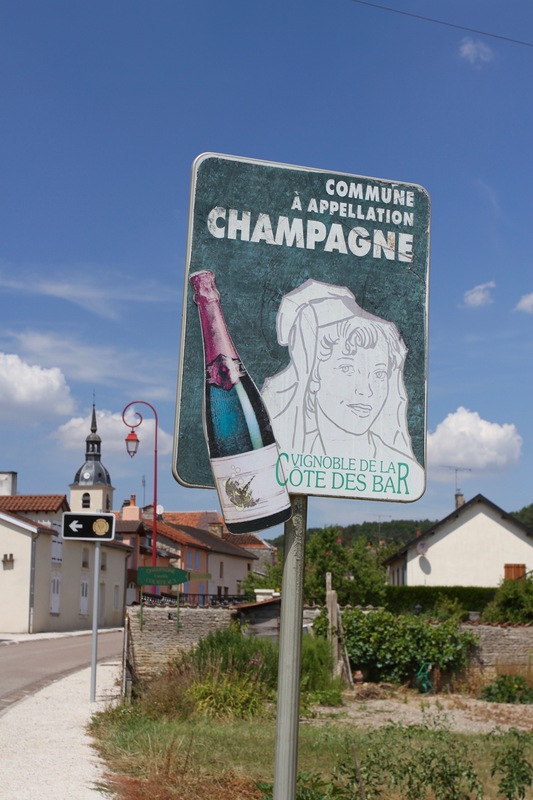 This area definitely plays second fiddle to more famous champagne regions further north, but one article I read claimed this was emerging as one of the ‘hottest’ champagne regions in the country. I must have been ahead of the trend curve because I hardly saw another human being for large parts of the journey. 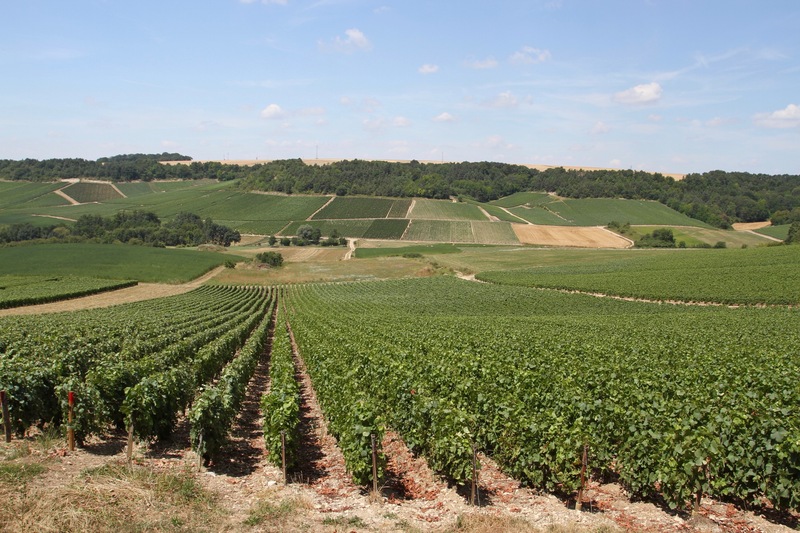 The obvious thing about this region, is that the vineyards are much more dispersed than the densely planted areas around Reims and Épernay. The steep chalky ridges dotted with bright green vines are still there, but there are more patches of woodland and immense, sweeping fields of wheat and sunflowers. In some areas I drove for several kilometres without seeing a single grape. It was harvest time for wheat and many kilometres were spent stuck behind massive tractors on narrow lanes. Time, it seems, is irrelevant in this region. It is, however, a region with a long memory. The Côte des Bar has an understandable chip on its shoulder thanks to an early 20th century dispute with the more prestigious champagne regions to the north. 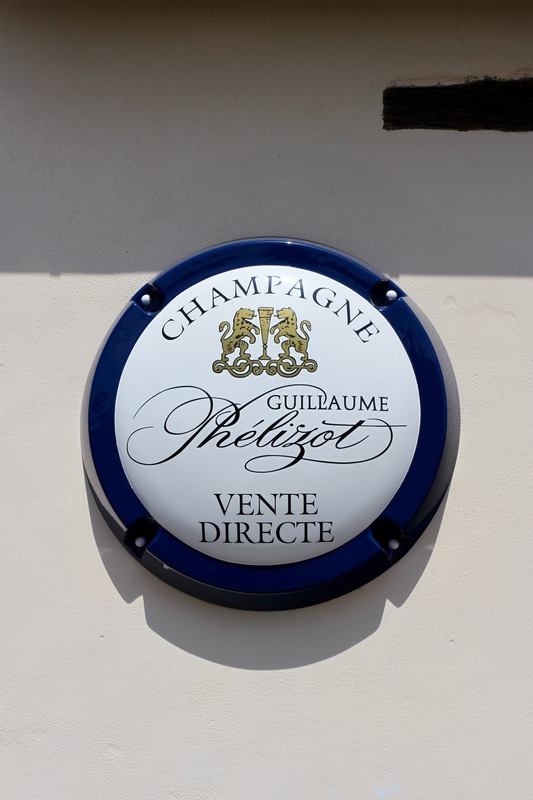 Despite the northern producers buying champagne grapes from here to add to their own wines, in 1908 they lobbied for its exclusion from the official champagne region. 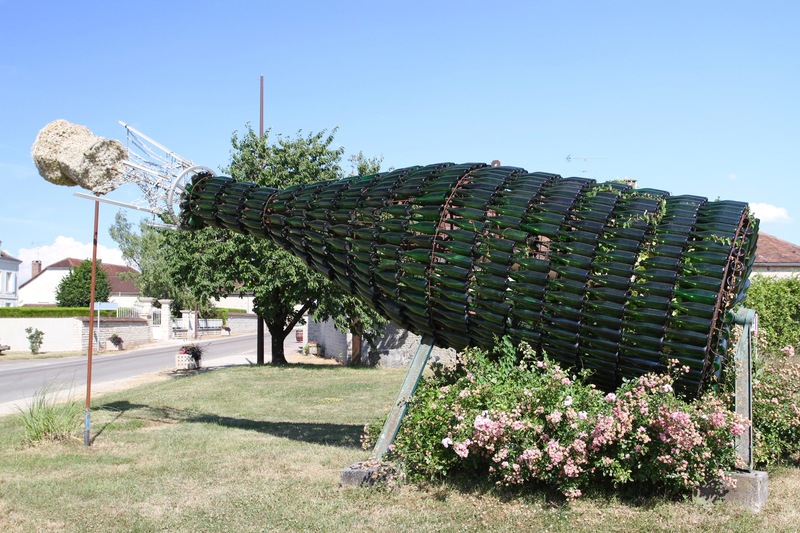 In the most French response possible, the Côte des Bar growers rioted. The region was eventually allowed to be categorised as a “second champagne zone” in 1911. Justice was only served in 1927 when it officially became a champagne region on a par with the other regions. That’s politics champagne style. I spent the best part of the day meandering around the region, and was glad I’d made the effort. It’s absolutely beautiful. 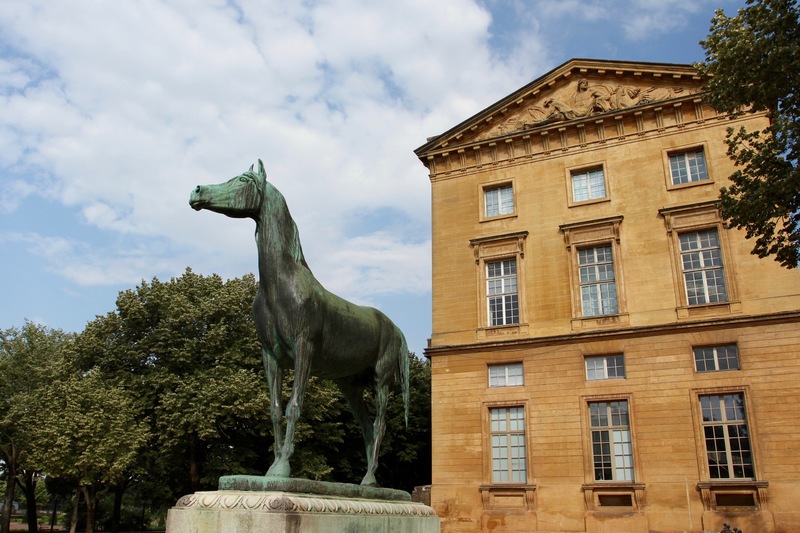 Metz is a city with an extraordinary history, which can be traced back over 3,000 years. There was a Celtic settlement here before it was dislodged by the Romans, who in turn were displaced by the Franks, from where France gets its modern name. Most famous of all though, this was the birthplace of the Carolingian dynasty. The unfortunately, but amusingly, named Pepin the Short was the first of the Carolingian’s to be crowned King of the Franks in 751. He was the great, great grandson of Bishop, later Saint, Arnulf of Metz. More importantly, he was the father of Charlemagne. While it might be something of an overstatement, Charlemagne is often thought of as the “Father of Europe”, reflecting his role in unifying much of Western Europe, and for converting his subjects to Christianity – whether they wanted to or not. He ordered the execution of over 4,500 Saxons who refused to convert. 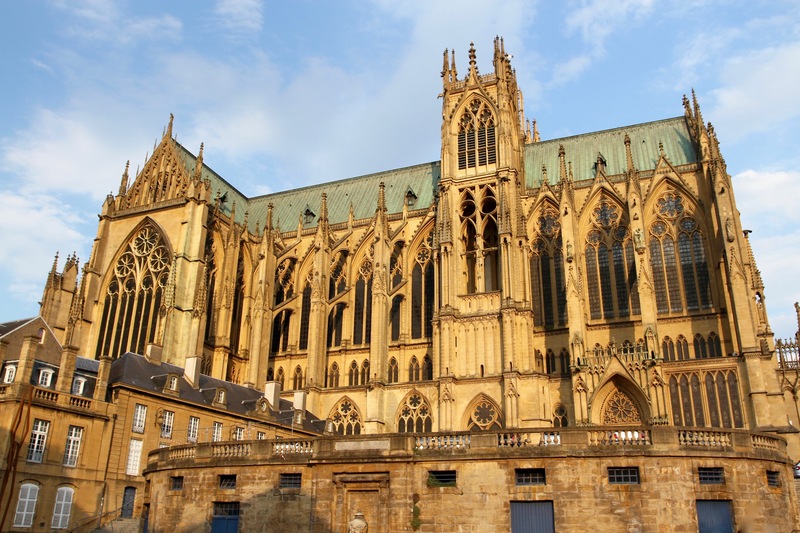 The history of Metz during this period is entwined with the Carolingians, becoming an important religious, cultural and economic centre at the heart of an expanding dynastic empire. It’s a period known as the Carolingian Renaissance, a flourishing of the arts, literature, architecture and legal reform. Charlemagne gathered around him Europe’s leading scholars, who played a critical role in the renaissance. 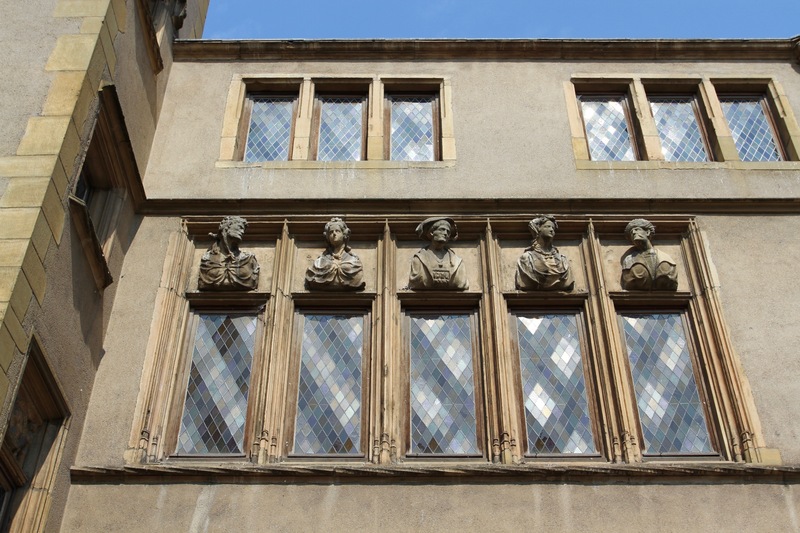 One of whom was Alcuin of York, a scholar from the northern English city – who also has a college named after him at the University of York, where I studied history. 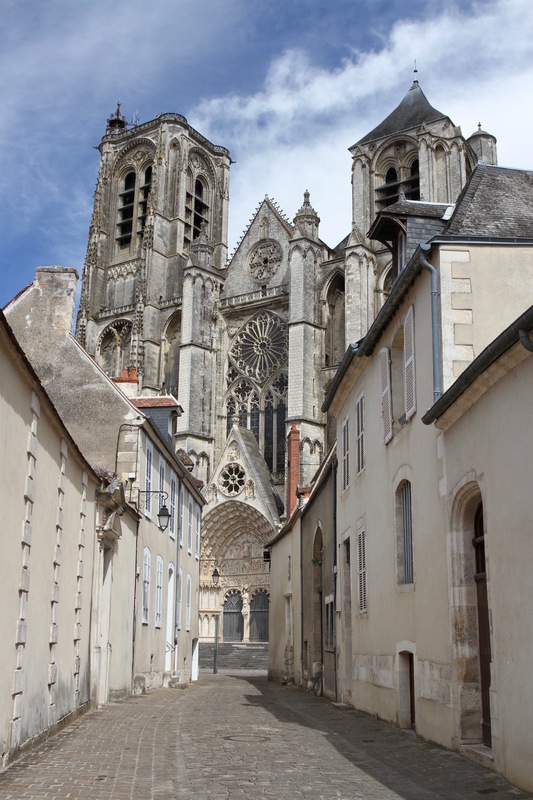 Alcuin was based in Tours, and would have been very familiar with Metz thanks to its role as a centre for theological learning and innovation. 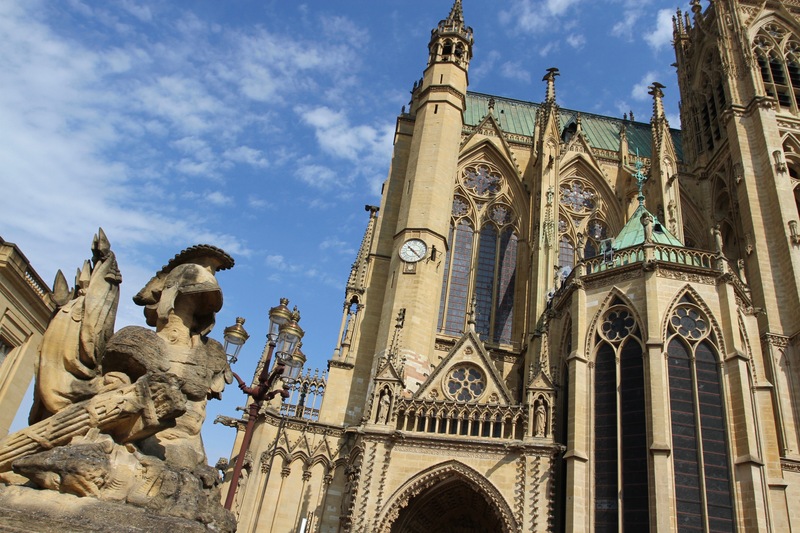 Waves of history have washed over Metz in the 1,200 years since the Carolingians. Much of it is still displayed in the wealth of centuries-old buildings liberally scattered across the city. 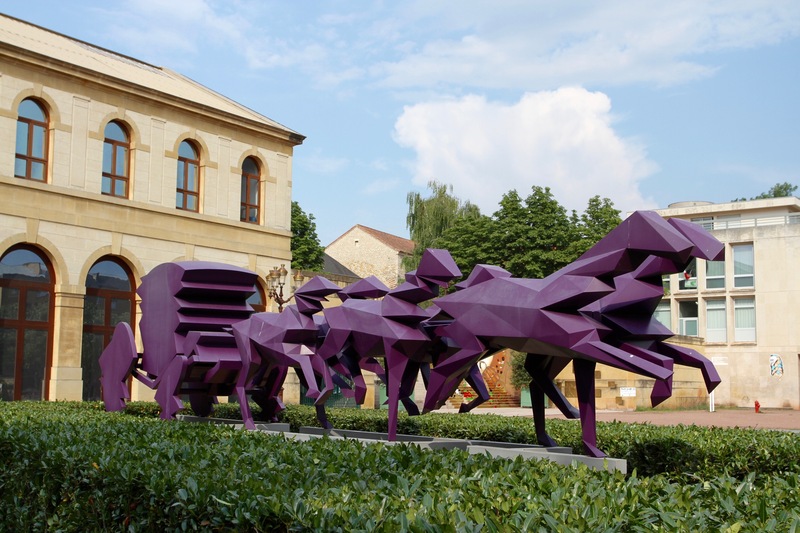 Like many other places I’ve visited, the many glories of Metz seem to have been overlooked by mass tourism, although there is no denying that the addition of the Pompidou Centre has definitely attracted more visitors. That said, because the Pompidou is next the train station you could visit from Paris without ever seeing Metz. That would be a big mistake. 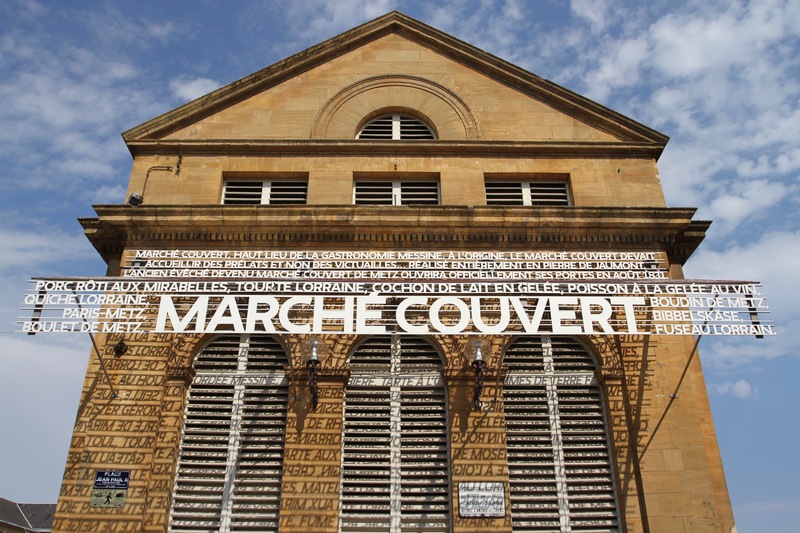 Despite a debilitating hangover acquired during France’s World Cup heroics, I set off to explore the city before making a modern art pilgrimage. 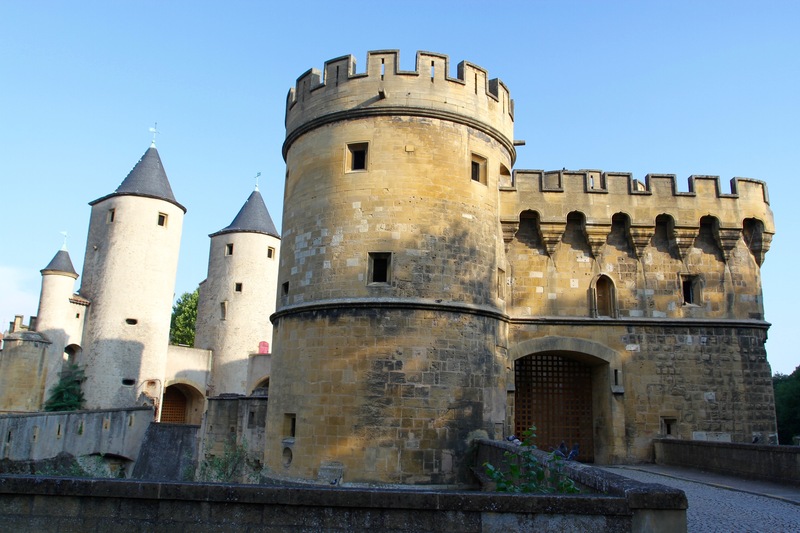 I made my way to the Porte des Allemands, a huge medieval defensive gateway into the town. 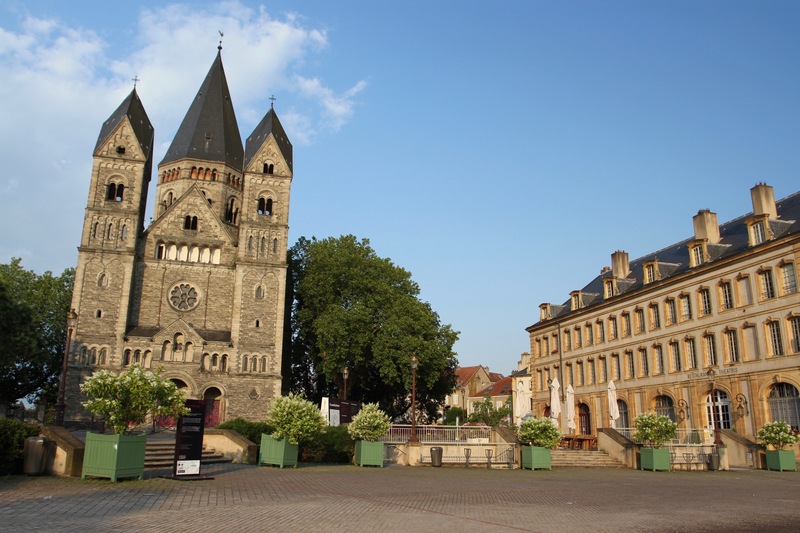 I walked through the Imperial Quarter, the area of Metz constructed during the post-1870 German occupation, before arriving in Place Saint Louis. This 14th century square lined with arcaded buildings was the scene of many festivities the previous day. 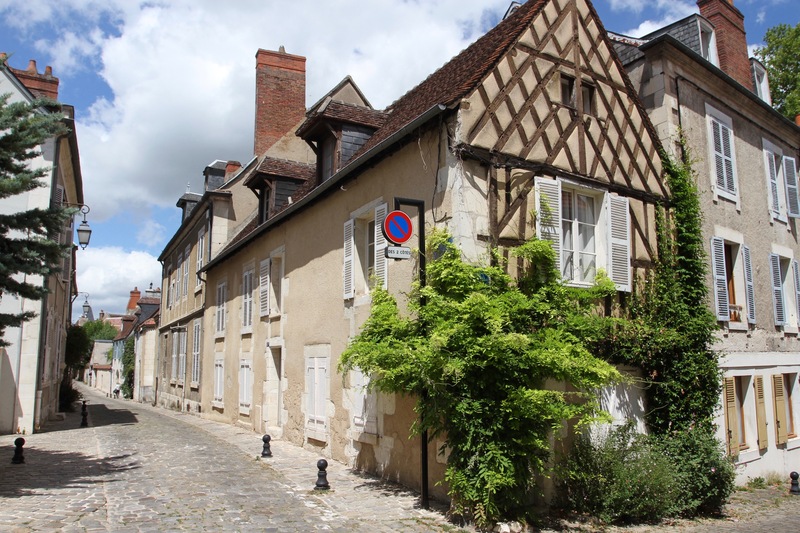 Just around the corner from here is La Maison des Têtes, a 16th century building that appears on the tourism literature of the town with great regularity. I wandered the quiet, pleasant streets nearby en route to the Pompidou Centre. I’d saved this for last as I thought it would be spectacular. In the end, it turned out to be perfectly enjoyable, but not the groundbreaking, hugely engaging gallery about which I had read so much. From outside, the Pompidou is an extraordinary sight, like a giant white sun hat draped across a wide open space. The galleries inside contained interesting and fun exhibitions but, on a searingly hot day for someone with a hangover, it was the air conditioning that really won me over. If that sounds like damning with faint praise, it’s not meant to. Afterwards I made my way into town in search of a late lunch and some shade. I found both in the narrow streets clustered just south of the cathedral. Delicious local bistro food and some Burgundian wine restored me to full health, and I went off to explore more of this relaxed, fun city. 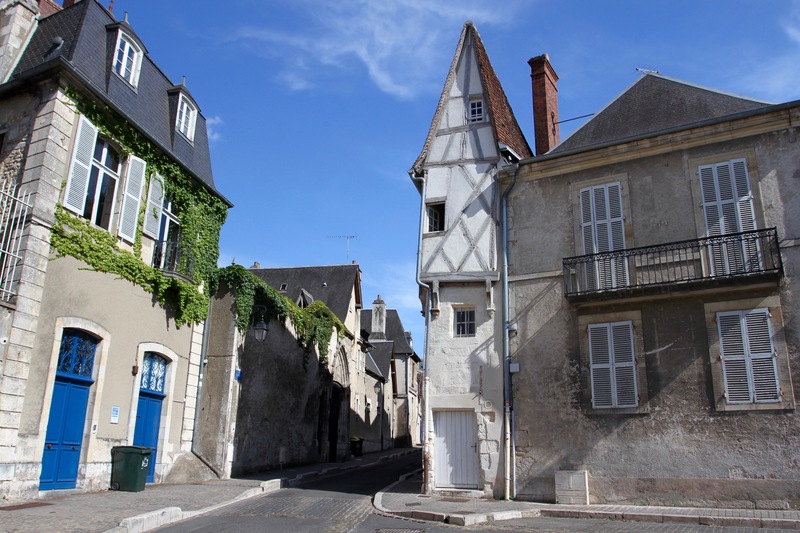 In the morning I’d be off again in the direction of Bourges, another under-appreciated city with a big history. For now I sat by the Moselle drinking in the views of the Temple Neuf and watching the sun set. 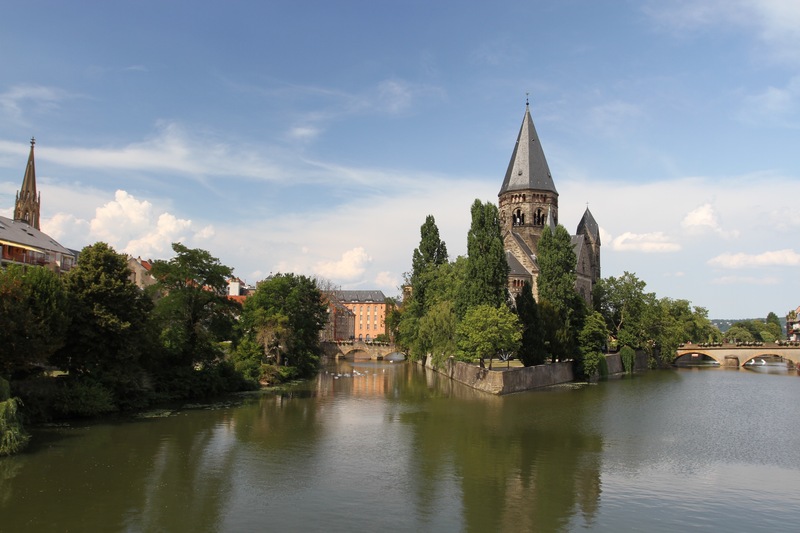 Sitting at the confluence of the Moselle and Seille rivers, Metz is a fascinating, historic and attractive city. 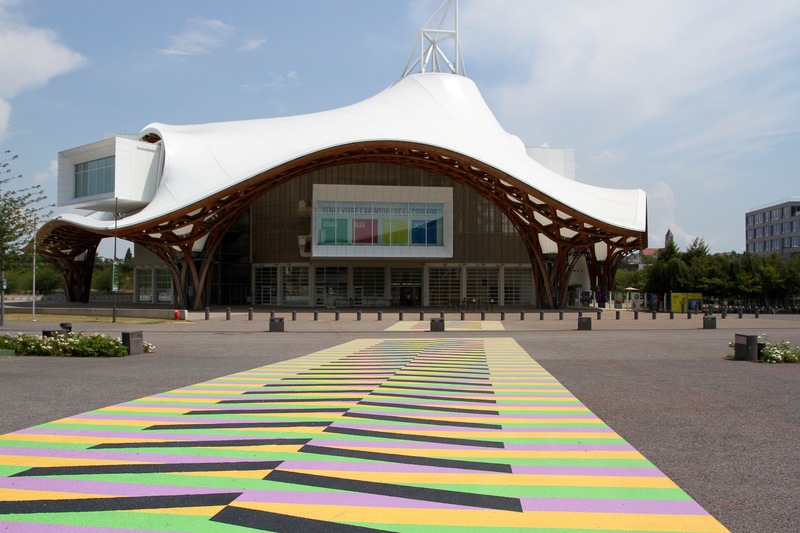 It comes complete with an array of cultural attractions, of which the town’s Pompidou Centre is only the most famous. 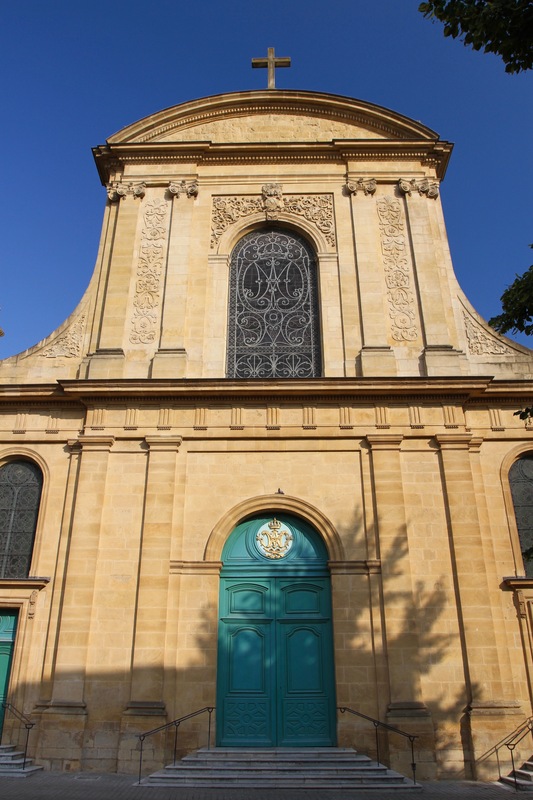 I arrived in the early evening on a Saturday and went for a stroll through Les Îles, the larger of Metz’s central islands and the compact smaller island where the Temple Neuf sits picturesquely in the middle of the Moselle. 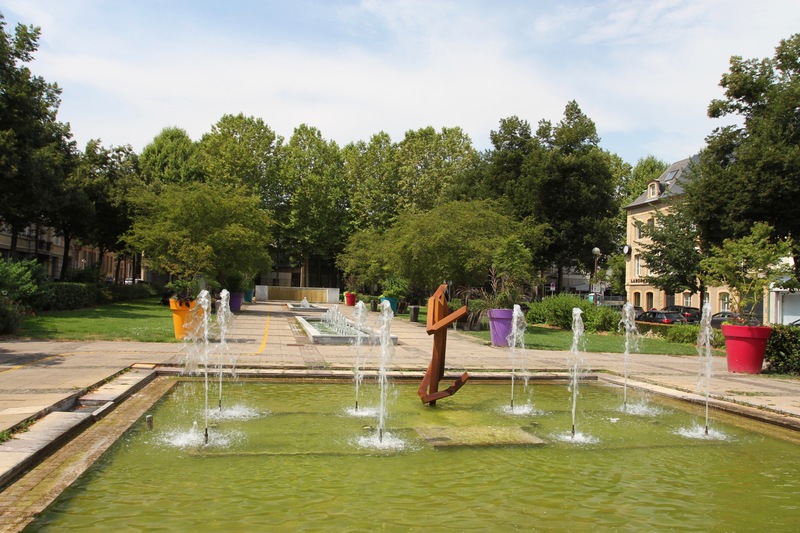 A charming introduction to a town with many charms to recommend it. 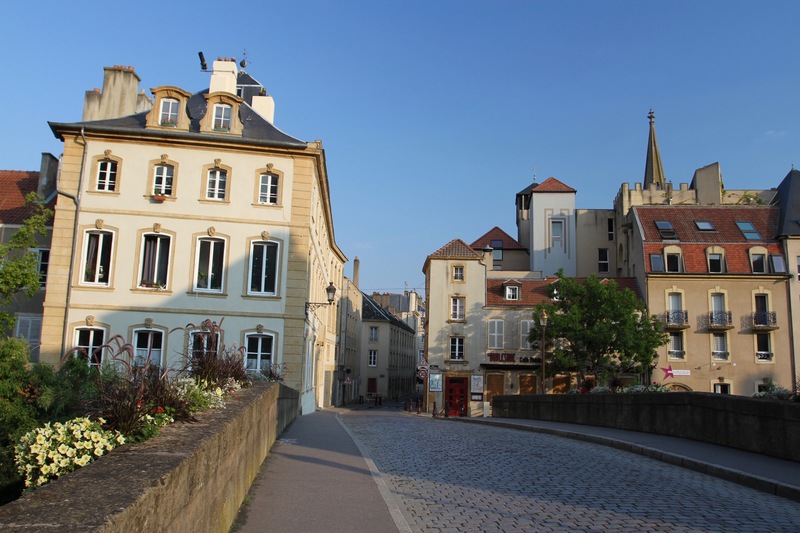 Crossing the river, I reached the winding cobbled streets of the town’s ancient centre, which on a Saturday evening the night before the World Cup final were buzzing with life. Tables spilled out onto the largely pedestrianised streets, with friends and families enjoying dinner and drinks. The whole atmosphere was carnival-like. The centre of the town is dominated by the massive Saint Stephen’s cathedral, and I arrived beneath its hulking mass just as the sun was setting, and setting it aglow in golden light. The cathedral is famed for having the largest expanse of stained glass, some 6,496 m2, in the world. I’d have to wait for the cathedral to reopen the next day to get a look at the windows though. It was getting late and so I walked through the streets looking for a place to eat, ideally somewhere that served local specialities. Everywhere was pretty packed, but I eventually found a small brasserie with tables lining a cobbled street that was open late. Hanging over the street, and my head, was a large dragon. This is a city that comes with a dramatic foundation story involving dragons, the fire-breathing mythical beasts of medieval imaginings. The story goes that the first Bishop of Metz, canonised as Saint Clement, arrived in a town plagued not only by a dragon, but by a population of heathens. 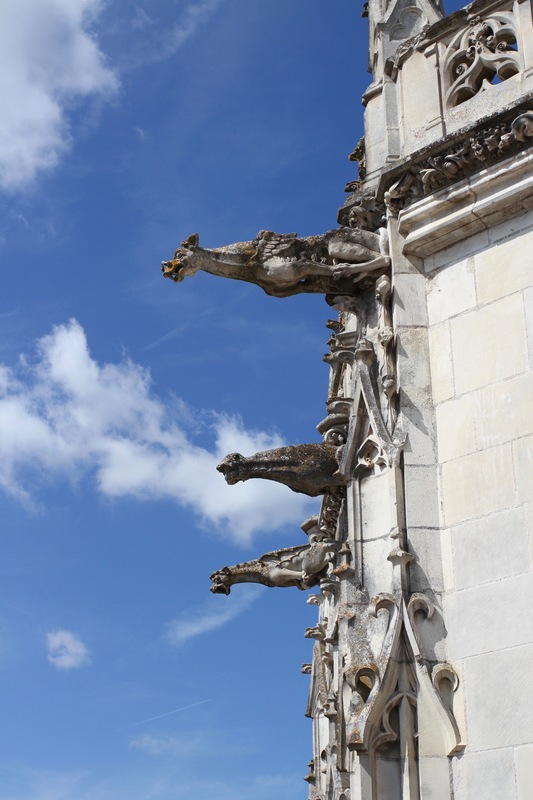 The breath of the dragon, known as the Graoully, is said to have poisoned the air and trapped the good folk of Metz inside the walls of their town. For added effect, the dragon lived in the old Roman amphitheatre. Clement got rid of the Graoully, but the incredibly ungrateful people refused to convert to Christianity, forcing Clement to bring someone, possibly the king’s daughter, back from the dead to prove his power. Once he’d resurrected her everyone toed the line. 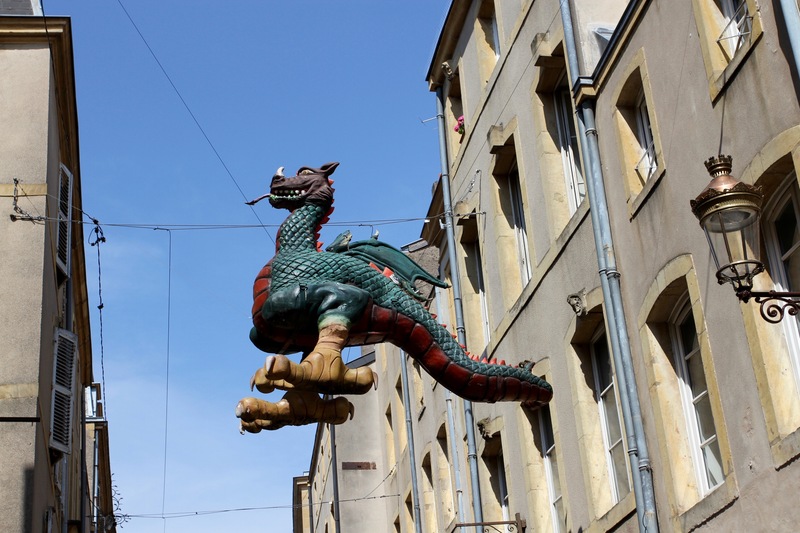 Metz went on to become a significant religious centre over the following centuries – it’s here that the Gregorian chant is said to have been invented – but in a nod to its earlier, heathen days, it adopted the dragon as its symbol. 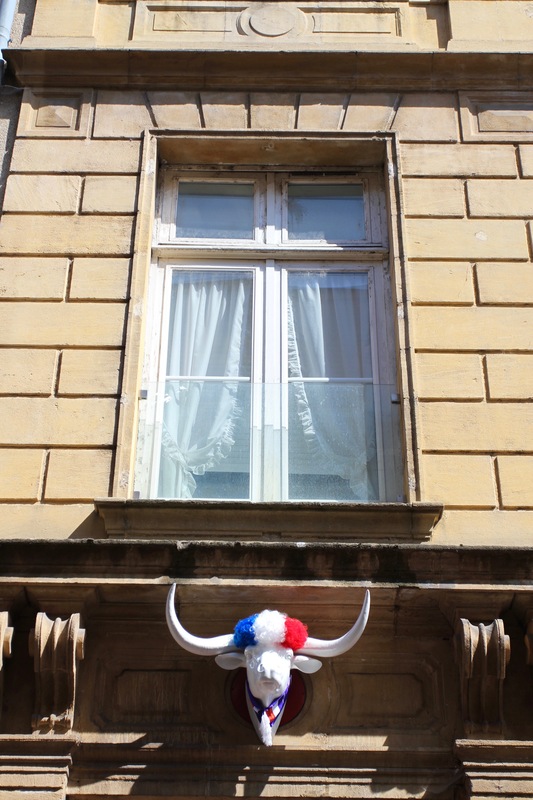 The next morning I set off to explore Metz before World Cup hysteria fully took hold, although there were a significant number of fireworks exploding around the town, and plenty of people were draped in French flags and wearing cockerels on their heads. I headed across the islands and through the city to the formal gardens of the Jardin de l’Esplanade close to the Arsenal concert hall. Except for a few runners and dog walkers the area was deserted, and I wandered around the pleasant parks unearthing various artworks until I reached the Palais du Gouverneur. 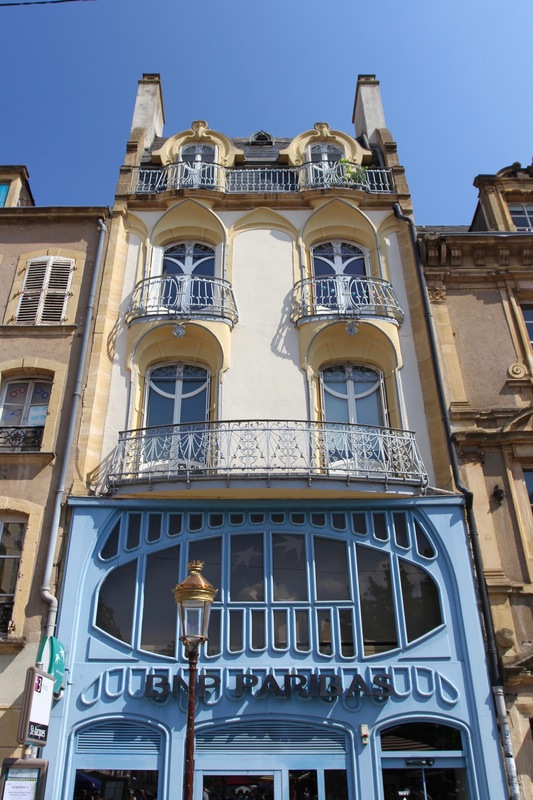 This grand building was built at the beginning of the 20th century and is a symbol of Metz’s troubled history. 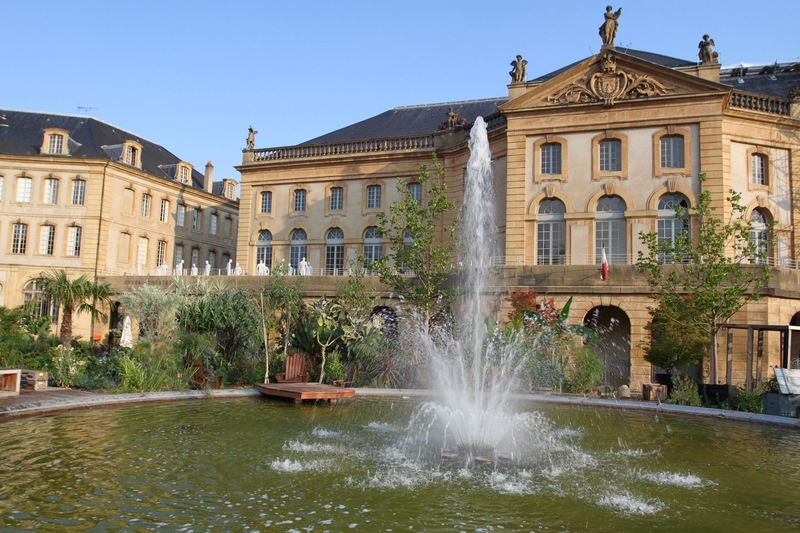 It served as an Imperial residence for the German Emperor, William II, during the period after France’s defeat in the war with Prussia in 1870. The city, like much of the Alsace and Lorraine region, was controlled by Germany until the end of the First World War. As I admired the building, in the distance I could hear what sounded like military grade fireworks exploding in imitation of that conflict. Watch the videos for proof! Preparations for the football seemed to be reaching a peak. I made my way towards the centre and joined the increasing numbers of excited people looking for a place to watch the match. 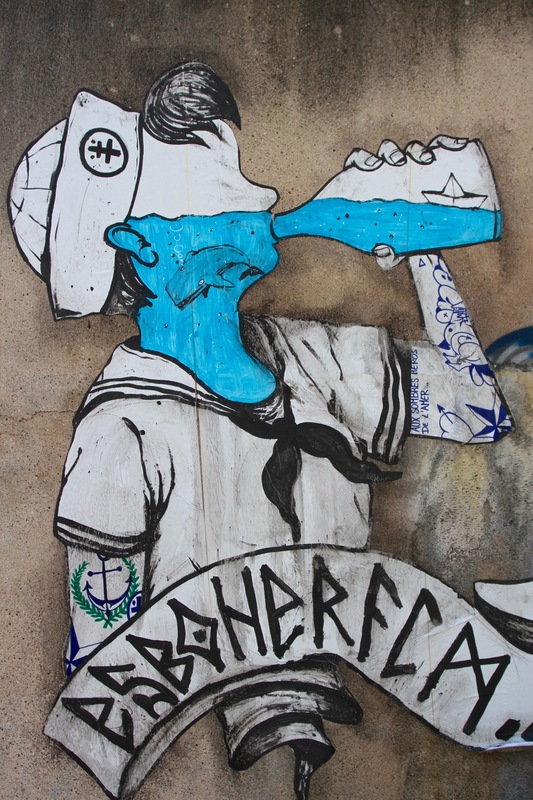 La Marseillaise was ringing around the streets and an awful lot of alcohol was being consumed. The rest, as they say is history, but it will take quite some time for me to forget the scenes before, during and after France’s victory – it also took me a while to recover the next day.